I am an entrepreneur working to build my empire and help others in their journey along the way. 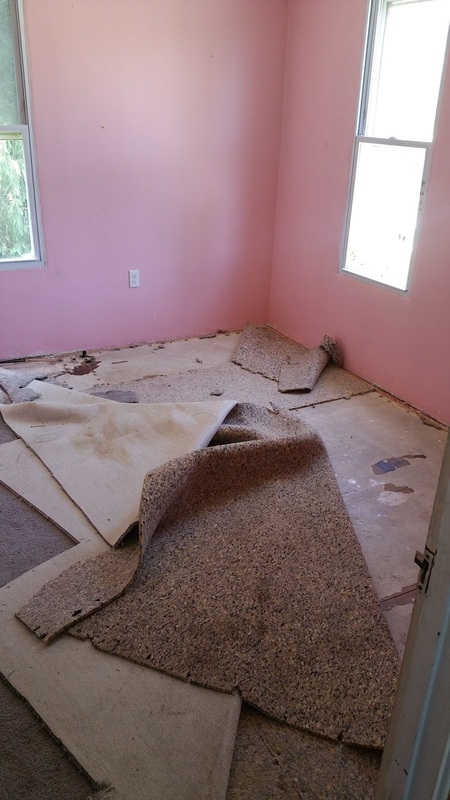 If you have done any kind of research on becoming a real estate investor or have even simply considered having some work done on your own house, then you’ve heard the horror stories related to contractors. We’ve heard all of the stories about contractors abandoning projects, taking the money and running, or spending way over budget; but we simply didn’t have to worry about any of those issues. We have a contractor that makes promises they will deliver, someone that won’t leave us hanging, and someone that will grow with us and our business. 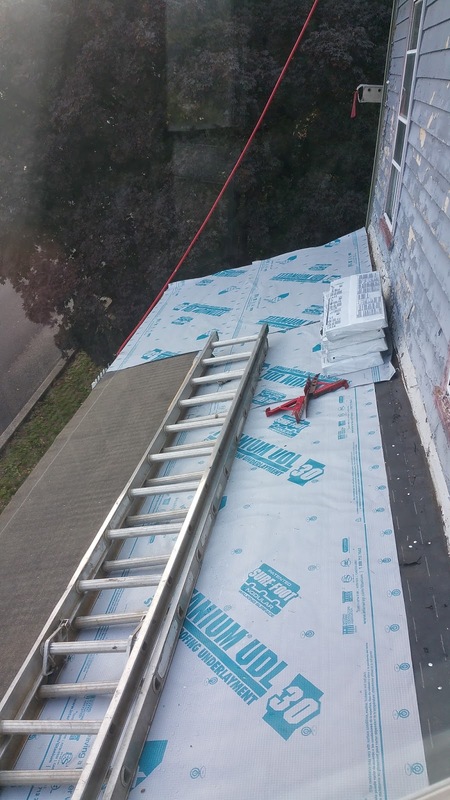 We have a friend that is a contractor. It’s going to be the best business relationship ever and we are going to take over the rehabbing world! We were in the process of building a dream team. Our contractor was highly motivated. His energy and motivation was contagious and inspirational. 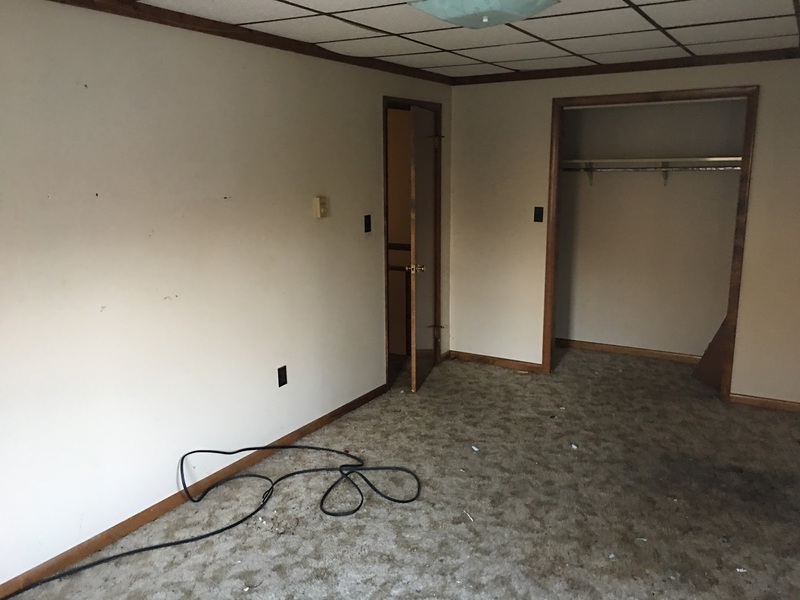 We couldn’t wait to settle on a house and begin the demo process. The realtor that we were working with was the contractor’s girlfriend. She was also a very driven person seeking to catapult her career to new heights. The ambition that they brought to the table was a sure win. The cool part was that they were working to build a brand together like a wannabe Chip and Joanna Gaines couple. They have the cute kid to exploit in marketing gimmicks and even bought chickens. The perfect family to compliment the perfect business partnership. Things started out with a bang. There was a ton of commotion and activity around the rehab as old fixtures and debris was being removed from the house. We would get excited every time that I’d stop by the job site to check out the progress. We have to admit, seeing the result after demo was a bit overwhelming trying to imagine how everything would be put back together again. That worry quickly subsided because, heck, I’ve got the best team looking out for our interests. 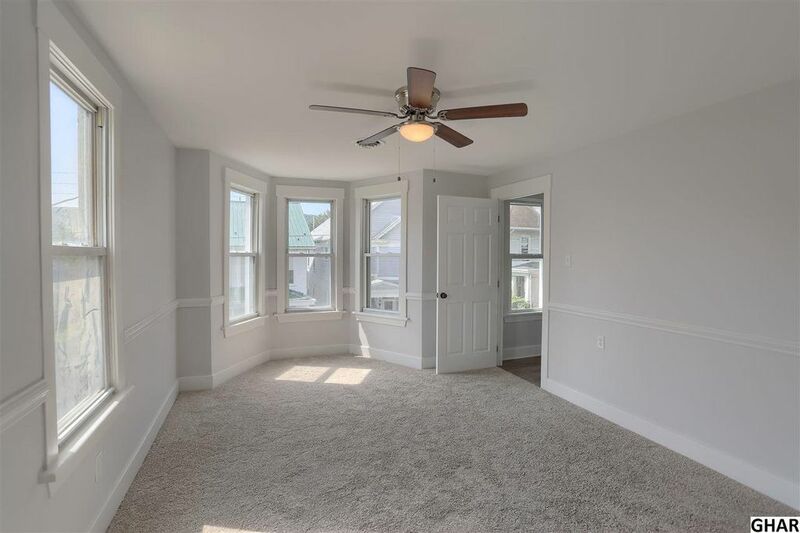 I’ve got faith in them and we all benefit when the job is complete; the realtor gets the listing and commissions and the contractor agreed to a percentage of the profits, so of course it’s in all of our best interests to get the house rehabbed and on the market as soon as possible. Not long after the demo was complete, there seemed to be a distraction or two. There had been some exterior improvements that really screamed progress. 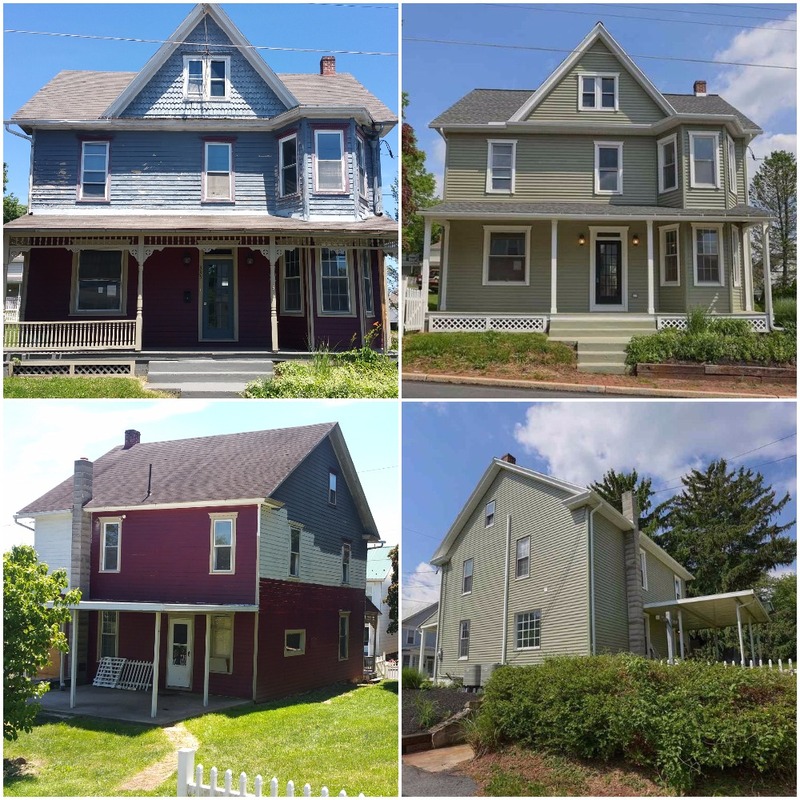 A new roof and siding transformed the curb appeal of the house and created quite a bit of excitement around the neighborhood. We were excited about the new look and could see the potential. 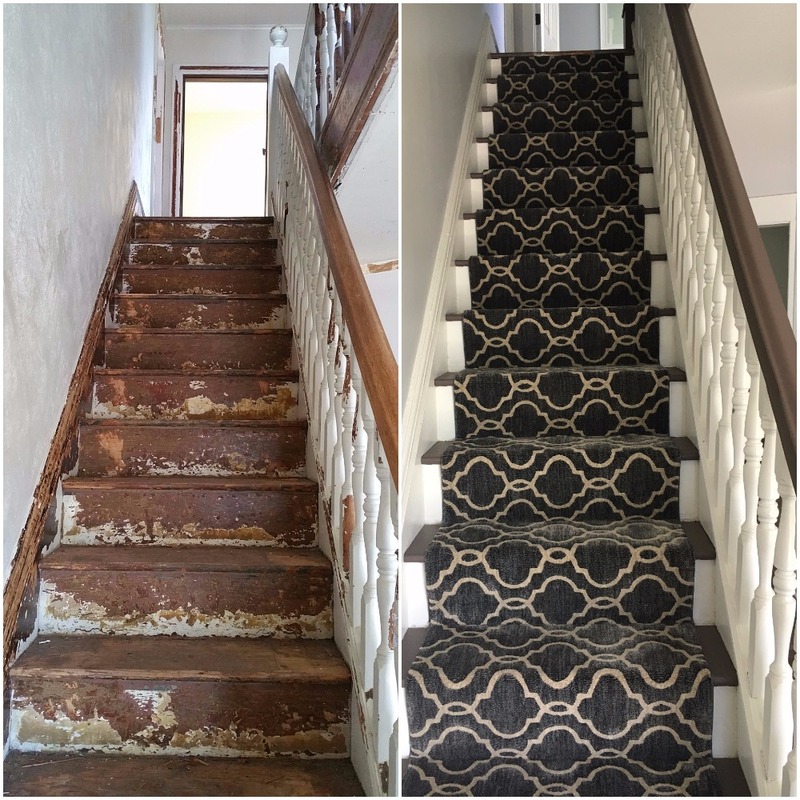 We couldn’t wait to see how the improvements inside would turn out. 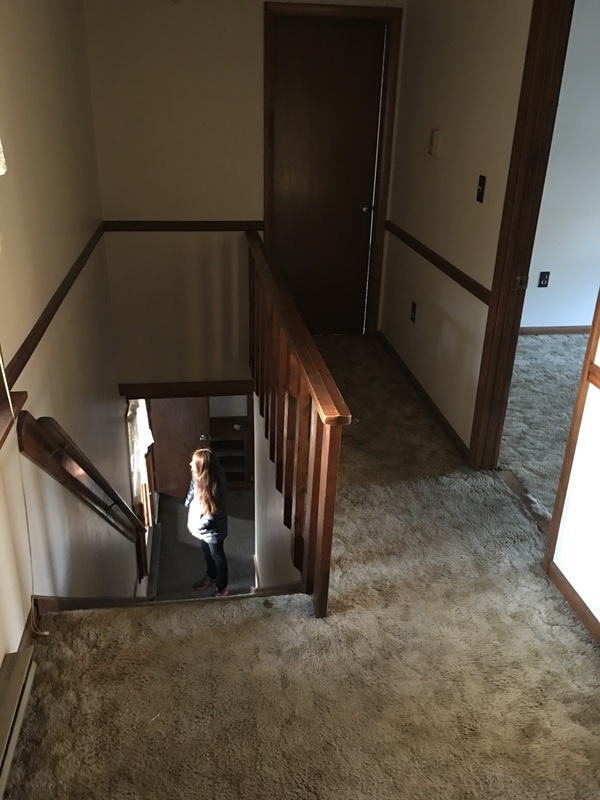 While we were excited about the progress of the rehab, the contractor was increasingly excited about a new house that he was about to build for him, his girlfriend, and the cute kid. 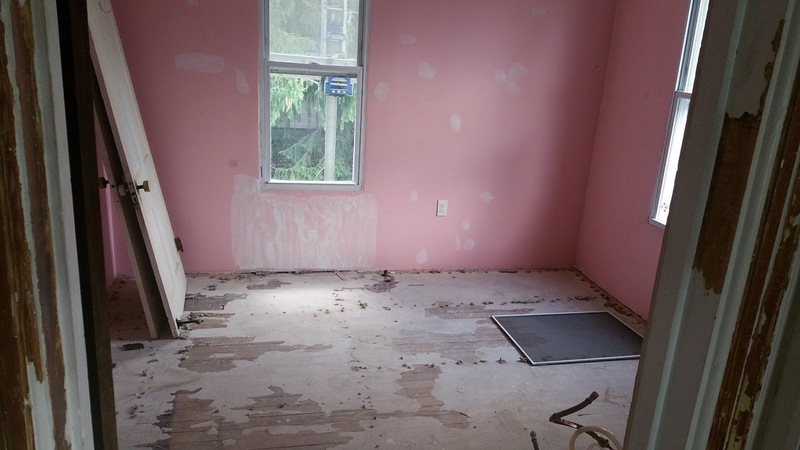 The contractor assured me that this would not impact the progress of the rehab since he is a professional and capable of managing multiple projects. Yeah right. We regret not firing our contractor. We regret this decision every single day that work drags on at the rehab. Our weakness was doing what we felt was the right thing in helping a friend. After all, he helped to open our eyes the opportunities and excitement of rehabbing. He had already invested time and energy in the project and we still wanted to give him the share that we had agreed to. We offered to help find sub contractors to complete the work and got lip service that he was working on it and that he will be there to finish the job. 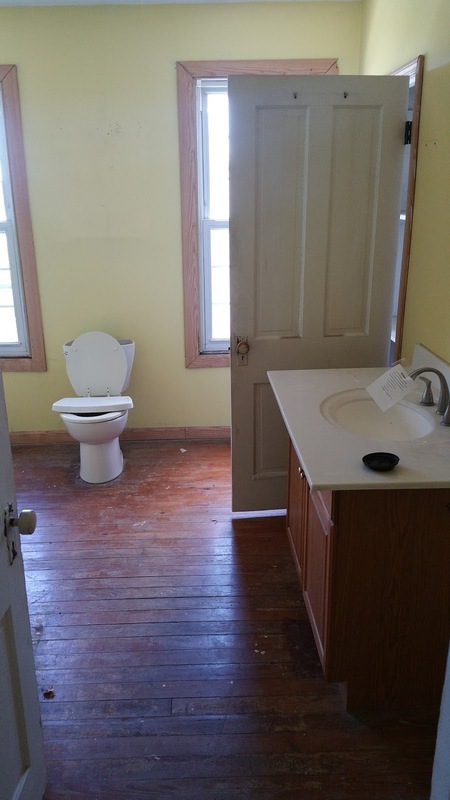 We started talking with other contractors to see if they could provide guidance on how to go about getting things finished without our contractor “friend”. Throughout this entire endeavor, we never ever considered abandoning our agreement to give him the negotiated percentage of profit. We continued to look out for his interest in the project that he abandoned. It’s like we cared more about his share than he did. So this post could go on and on about the specific details of frustration and disappointment that we are facing, but it makes us sick to think about how ignorant our contractor has been that we are trying to complete this deal with some kind of profit. This is a job that should have taken 6 months, but has missed the deadline by almost a year. The optimist in us thinks that at least there is a benefit from a capital gains tax perspective, if there’s even a profit. In the end, the worst part is being disappointed by the so called friends that we thought we would build our dreams with. Their loss. They have turned into nothing more than shysters. If they continue down the path that they are on then they are destined to have a run in with karma and a few terms like fraud and embezzlement. Honestly, we just want to move on and still make good on all of our promises. However, the contractor expects to underdeliver, break all promises, go over time, go over budget, steal, and then ask for more money… haha!! 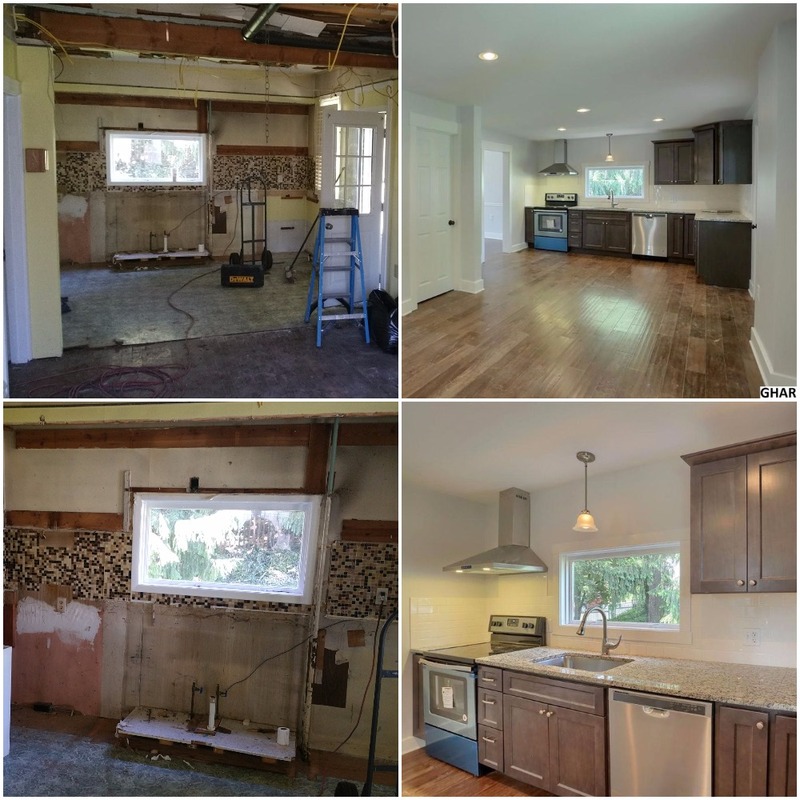 Fortunately, we have not let this experience deter us from our real estate endeavors and we are already wrapping up our next project with a new contractor with much more success. Subscribe to our blog to get notifications on our future posts and learn about what we have done differently to ensure that we have chosen a honest contractor. 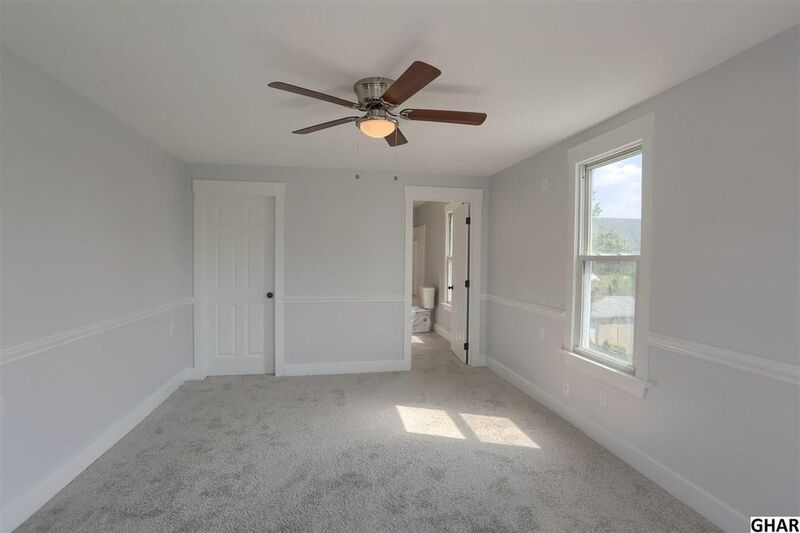 We personally recommend Hawk Rock Construction or Five-Star Contracting which serve Harrisburg, Pennsylvania and the surrounding areas. ** Oh yeah. I forgot to mention the ending of the business relationship with the realtor. She completely forgot about us until it was time to list the property so that she could cash in on a commission. She was simply too busy with building her own house and self indulgence to pick up the phone, even once in over a year! Even after giving her a chance for redemption and trying to come up with an amicable resolution, she was arrogant and ignorant to the end. Which reminds me… where’s the buyer that you said that you had? Oh wait, never mind. Don’t care. You’re fired. The analysis of a real estate deal will absolutely make or break a deal regardless of how well a plan is executed. This is why it is important to develop a repeatable process. This process should evolve to continuously improve by incorporating lessons learned from every project. Researching a potential investment property can be a time consuming activity. Of course you do as much research online as possible, but eventually you will need to drive out to the property to perform as much of a visual inspection as possible. 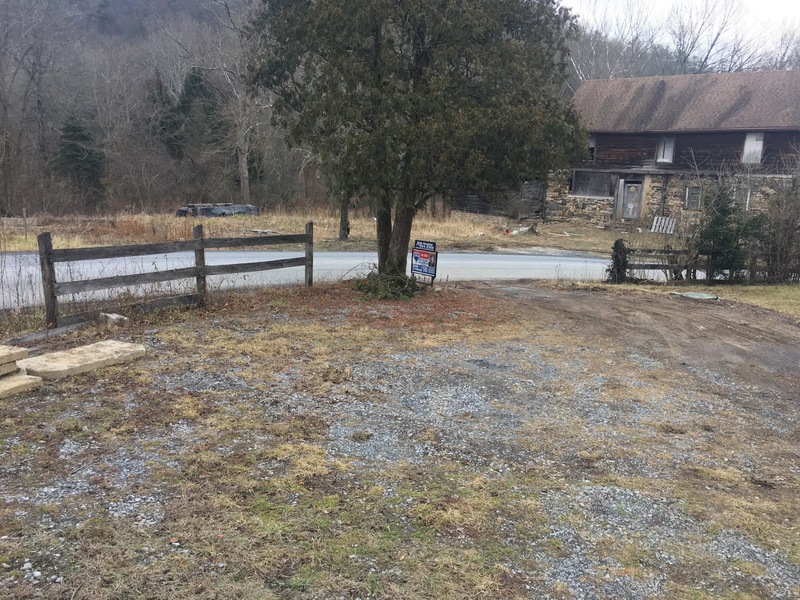 Before I determine whether or not I am going to take the time to drive out to a property, I like to gather at least some basic information on a property. Like; photos (if any), home size, lot size, bedrooms, bathrooms, sales history, rough estimate of comps in the area, taxes, and any other little tidbits that I can gather up. A good resource for a quick search is a real estate website such as www.zillow.com. If I like what I see, then I will print a copy of the property listing found on Zillow to take with me on the road. Another great resource is Google Maps. 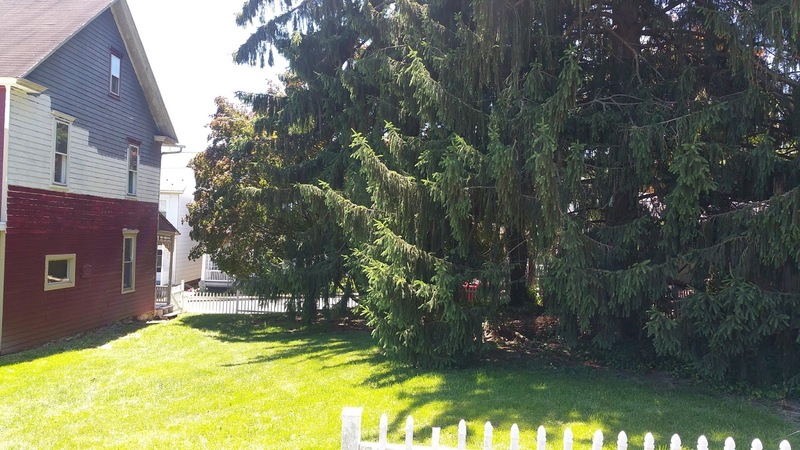 Sometimes there is a street view of the property that you’re interested in checking out. However, be cautious that the photos my be dated. 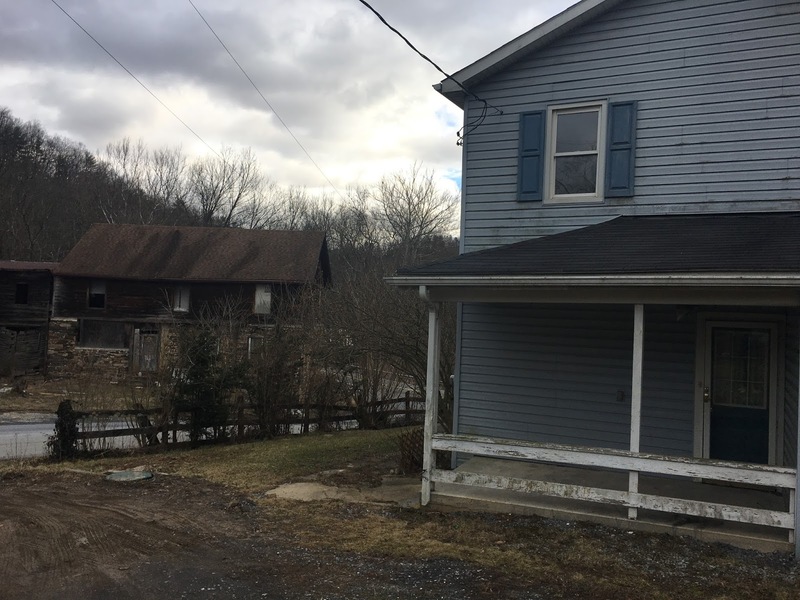 Additionally, if the house is in a rural area or a neighborhood, there is a possibility that there is not a street view option for the property. This simple tip saves a tremendous amount of time, not only in planning your prospecting route, but also in the amount of miles and drive time. I use a website called SpeedyRoute.com to put together the most efficient route to drive-by the houses that I deemed worthy to visit based on my research. The website appears to have a subscription based option, but I have so far been able to utilize the service for free and without signing up. Trust me, this is a huge time saver! You’ve spent time researching the property and driving to it, so do some due diligence and spend a little time adding to the information that you have already gathered. Take some photos, take note of the neighborhood (is the property next to a crack house, industrial park, highway, railroad tracks, etc…). Verify that the information that you found online matches up with what you’re seeing as you inspect the property. I cannot stress the importance of driving out to a property to validate what you’re seeing online. Do not make the mistake of blindly purchasing a property sight unseen. A great example of this is a foreclosed home that was listed on Auction.com that we checked into. 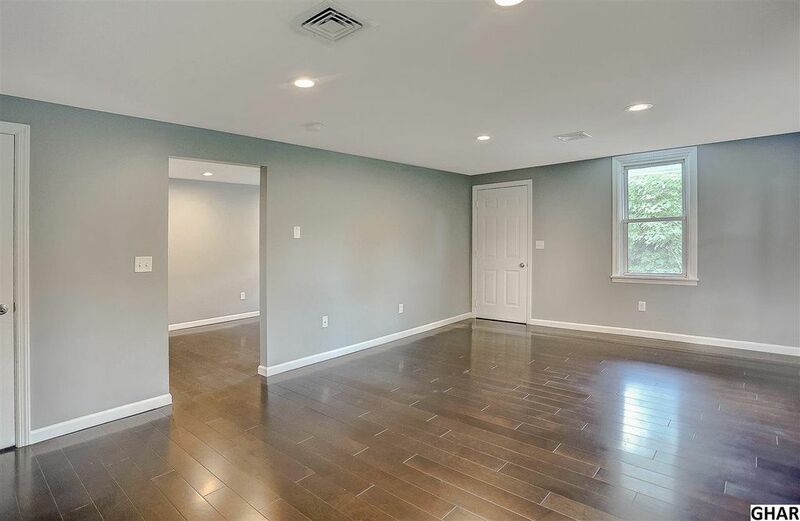 From the listing and the photos, everything looked great! This looked like a slam dunk deal. 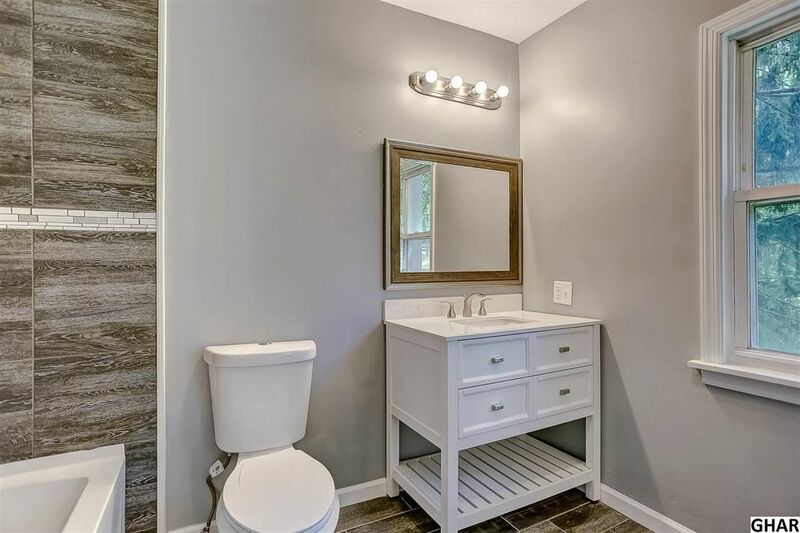 The house looked to be in great shape from the photos in the listing and even a look at Google Maps showed that house had some excellent curb appeal. Even simply driving by the house, it would appear that everything checked out. A quick walk around the property revealed that things were not as they appeared to be. An investor that works based on online research alone would be duped into purchasing this disaster. Don’t get duped. This house actually sits on top of steel beams about 35+ feet in the air! 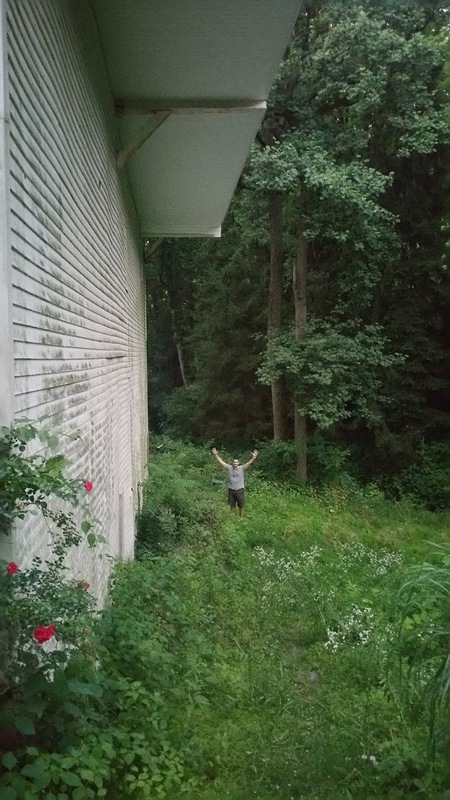 I’m 6’2″ and as you can see from the photo, that house is a looooong way up! From the road, everything looked like a dream come true. Once you got around back, it was an investor’s worst nightmare. Needless to say, this is a deal that we ran from and never looked back. Once you return from your road trip checking out potential deals. Review the photos and notes that you gathered. Determine which properties warrant moving forward and which ones are better suited for the trashcan. Now that the list of prospective deals has been narrowed down, it’s time to call in the help of additional resources to dig even deeper. A title search will identify all of the liens that exist against a given property. Obtaining the comparable sales (comps) from a realtor will provide you with an idea about what the property may sell for in good condition. Now that you have completed all of the research and obtained the necessary information on a property, it’s time to crunch the numbers. Using the information that was gathered during the drive-by, estimate what the property may need to make it marketable and sellable at the comp price provided by your realtor. Determine the remediation strategy of the liens on the property and how much it will cost you, all in, to purchase the property as is. Here is a quick and dirty calculation to determine whether or not a deal is right for you. 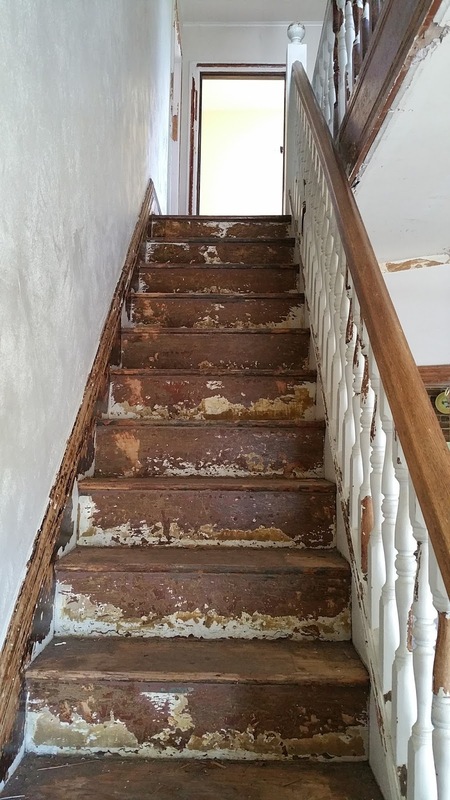 Keep in mind that once you begin rehabbing a property, there could be additional overages that were not taken into account. Make sure that you leave room in your profit margin to make sure that you always end up on top. If the After Repair Value of the property is less than the sum of the costs, then the deal will not work. Again, this is a very simplified way of quickly analyzing a deal. We will go into more specific details of what each each of these costs entail and how they can be calculated with seasonable accuracy. A great resource that helped to get me started on accurately analyzing deals is The Real Estate Rehab Investing Bible: A Proven-Profit System for Finding, Funding, Fixing, and Flipping Houses…Without Lifting a Paintbrush. This book is a must read for anyone new to real estate rehabbing or flipping. Not only does it help to take the guesswork out of estimating repair costs, it includes tools and templates that will help you to stay organized and kickstart your rehabbing process workflow. Now that you’ve done all of the leg work and analysis, it is time to close on the deal. It could be that you are buying the property at auction (so you know your maximum bid), you’re putting in a traditional offer through a realtor, or you’re purchasing the property from a wholesaler. Regardless of how you’re obtaining the deal, you’re now confident and ready! One of the projects that we didn’t highly publicize was our rehab at 2 Mill Road. 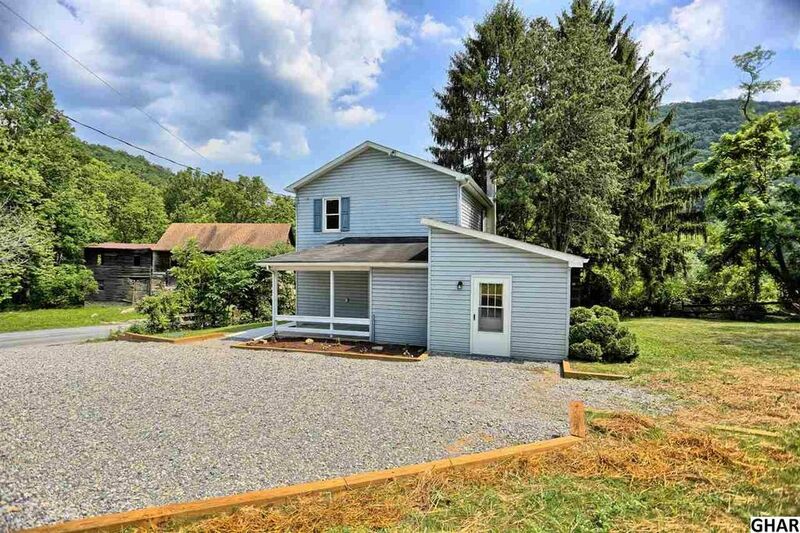 This house is located on a beautiful country lot with a little bit of history. The Chief Justice of the Supreme Court of Pennsylvania (1827-1851), John Bannister Gibson, was born on this property. There is even a historical marker on the edge of the property. 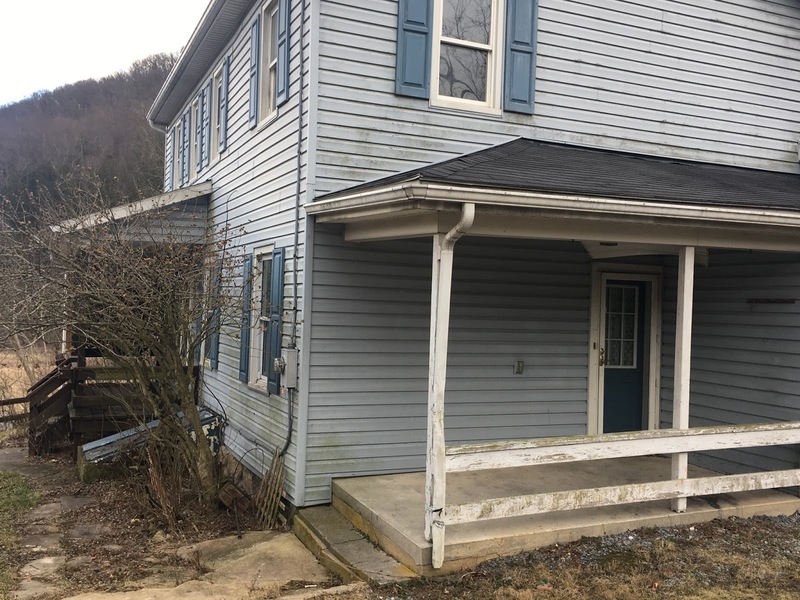 Although this is not the original house that John Bannister Gibson grew up in, it is the same property and banks of Sherman’s Creek where he spent his childhood playing and exploring. 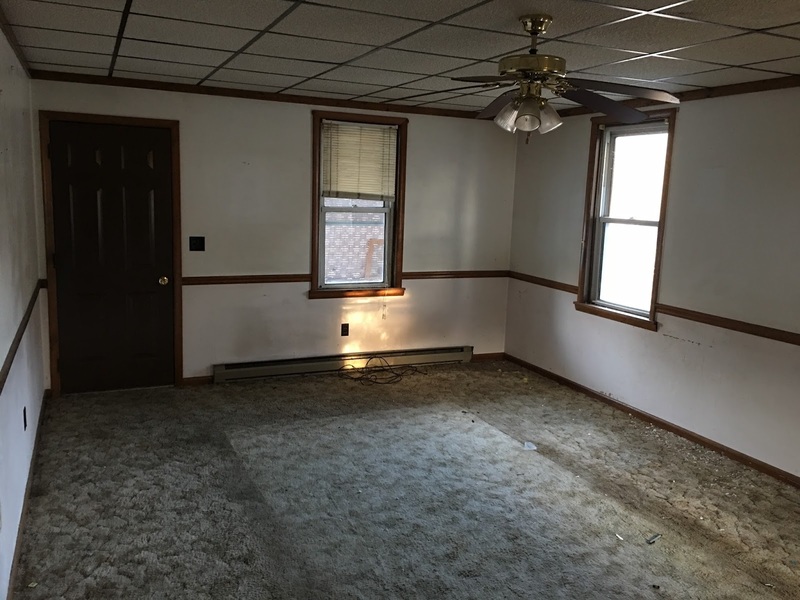 This three bedroom one and a half bath home was in dire need of some TLC. 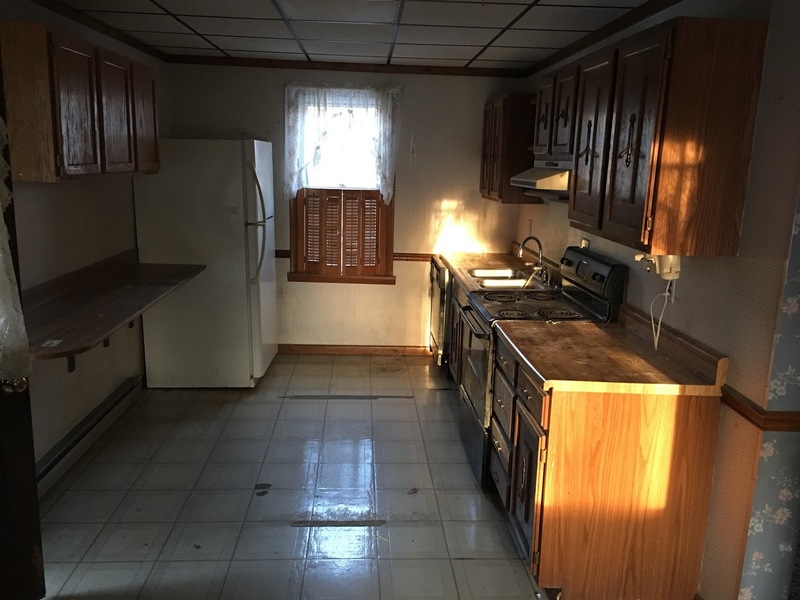 The kitchen was very small and outdated, along with every other room in the house for that matter. 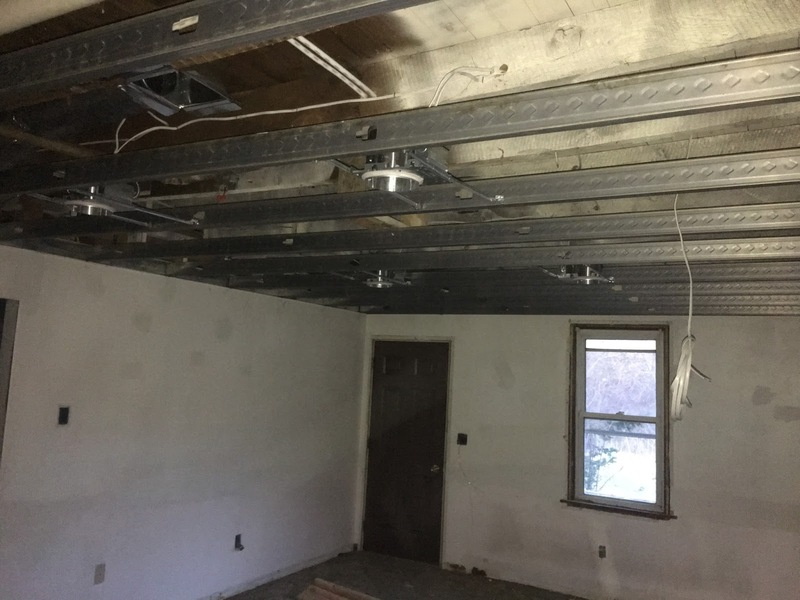 Instead drywall ceiling, there was a drop ceiling installed throughout the home. This was an immediate decision that the drop ceiling must go. We also decided to update the electrical and install recessed canned lighting, since the ceiling was coming down anyway. 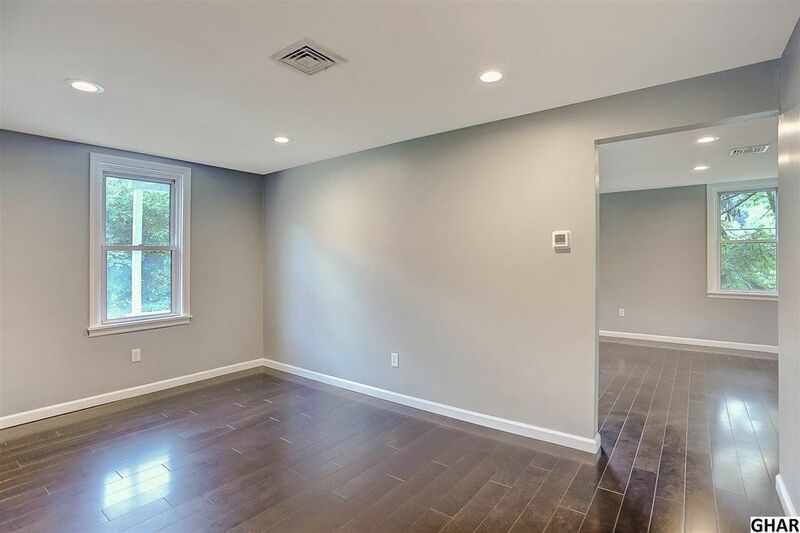 We had experienced some turmoil with a prior general contractor that had caused cost overruns due to repeatedly missing deadlines, so this was our first time using this new contractor. Overall, the experience was definitely much better and there was an overall profit made on the project. 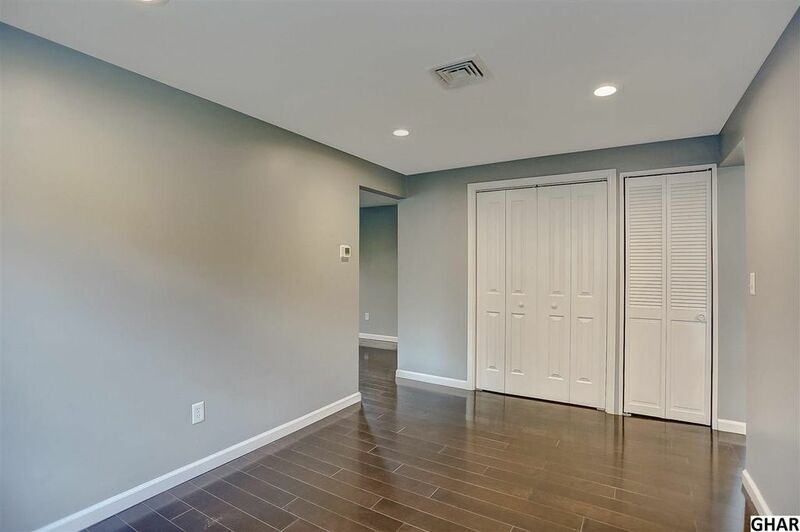 We were fortunate to not have to micro-manage this job as much as the 335 Front Street project and we learned how valuable a general contractor can be to scheduling, keeping sub contractors on task, and hitting the deadlines that they commit to. This project came and went very quickly, so there wasn’t a lot of time to document the progress. In fact, the house sold within 18 hours of being listed! 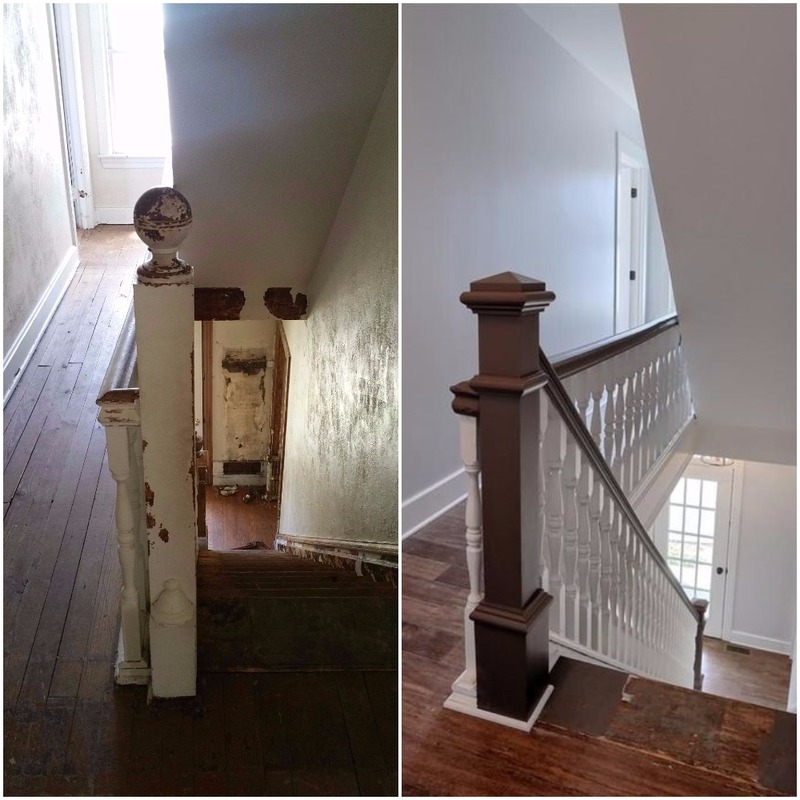 Since this rehab is completed and sold, this will be the only post about the progress. 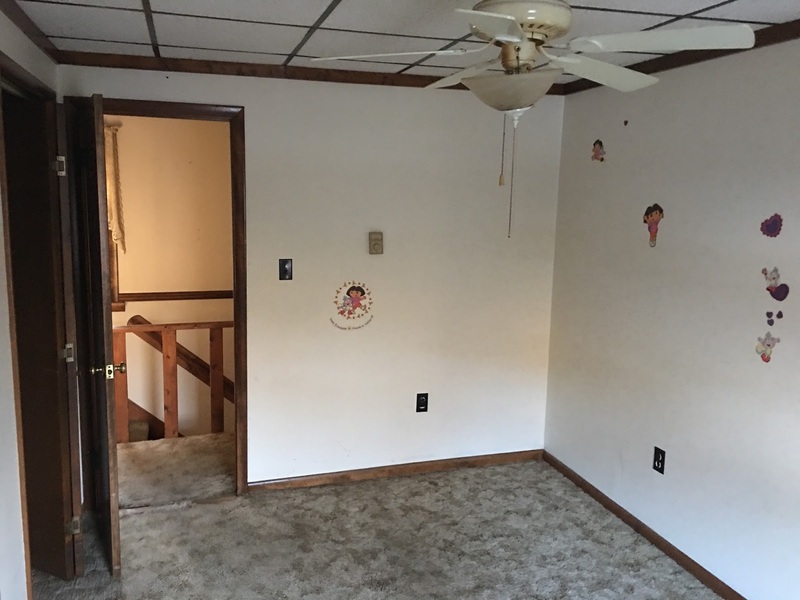 I will show the before and after photos where they are available. The first place I usually like to start is to show the outside of the home. 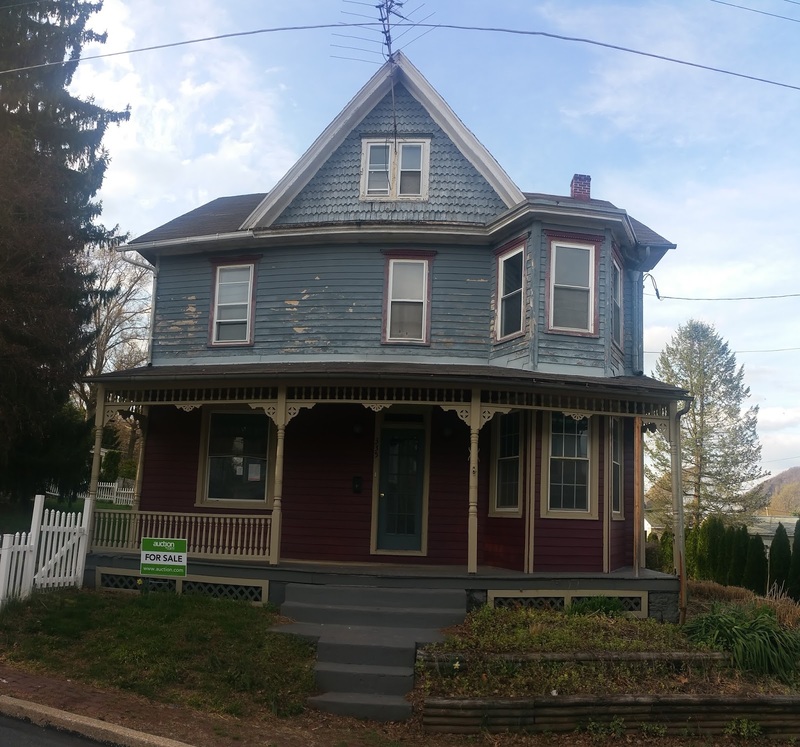 We did not replace the siding on this house, so there is not a huge transformational change, but a lot of work has been done. There were a couple of windows that were replace, the porches were painted, the whole house was pressure washed and clean, and a landscaper installed new flower beds and plants. The most expensive change that was made outside was excavating the driveway so that there was a more clearly defined parking area. We had a retaining wall built and widened the driveway to make it easier to pull out onto the road. The sidewalk was also ripped up and freshly poured. The kitchen started out dark and felt small. 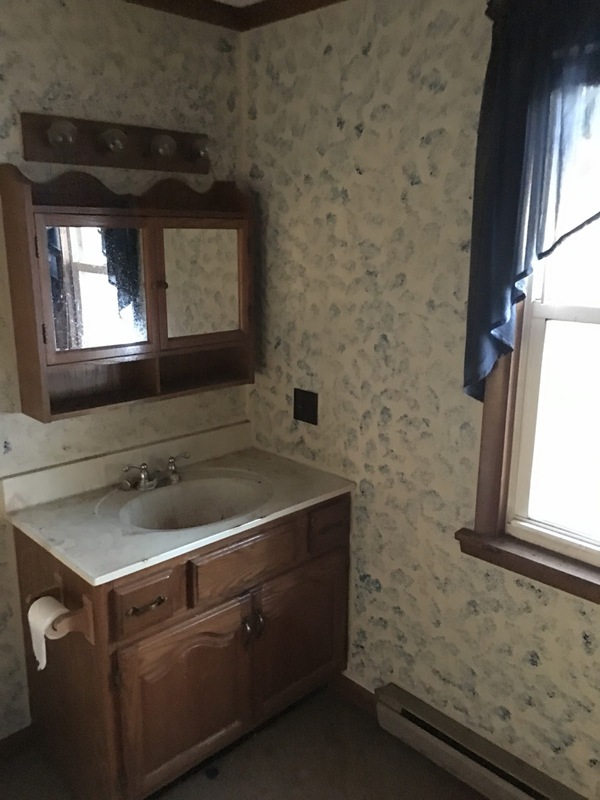 Prior to the renovation, there was a countertop attached to the wall opposite the sink and stove. The extra countertop provided more surface space, but it really limited the floor space in the kitchen to adequately move around. We like the finished product much better. Also, take note of the hideous drop ceiling prior to the rehab. 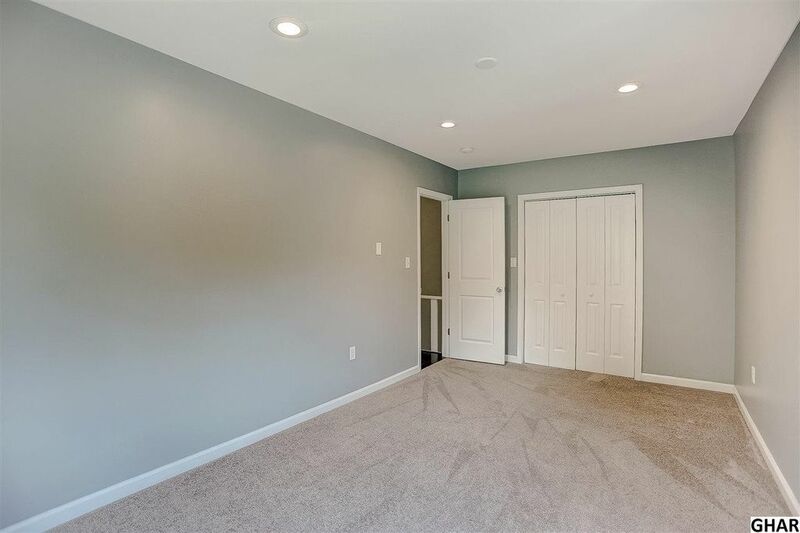 It was replaced with brand new drywall and clean recessed lighting. 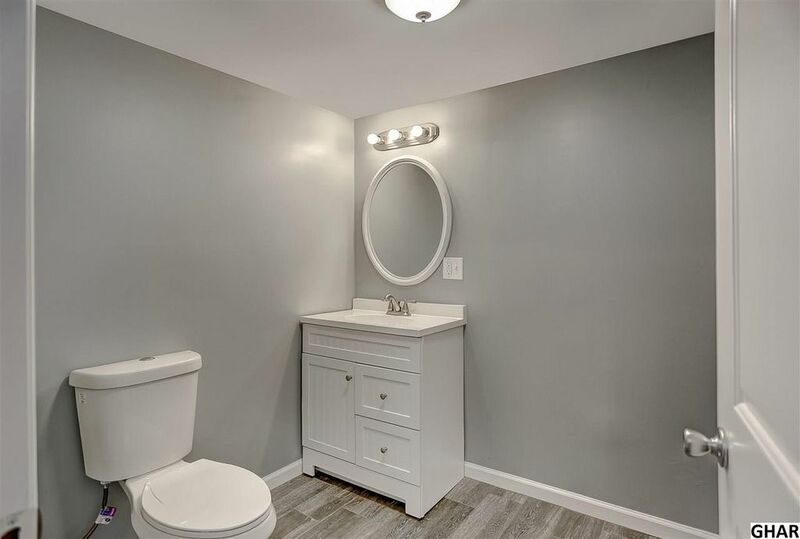 Regretfully, we do not have a photo of this bathroom before the rehab due to poor lighting in the room, but trust us when we say that it was a disaster! 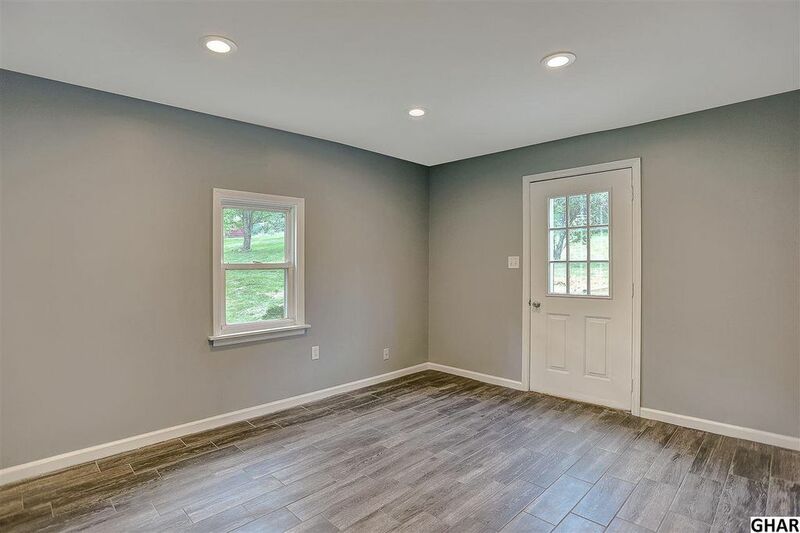 We love that this house has a mudroom! It’s perfect for storing all of your shoes and outdoor clothing so that dirt does not get tracked throughout the entire house. 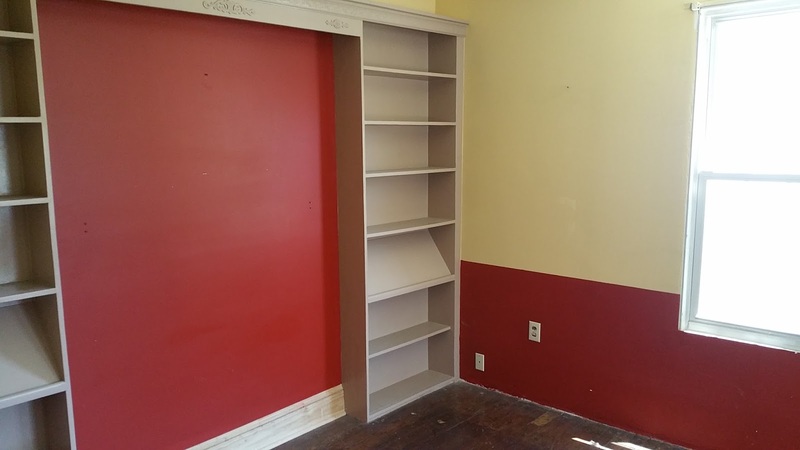 If time and budget would have permitted, it would have been nice to build custom storage and cubbies for shoes and coats. 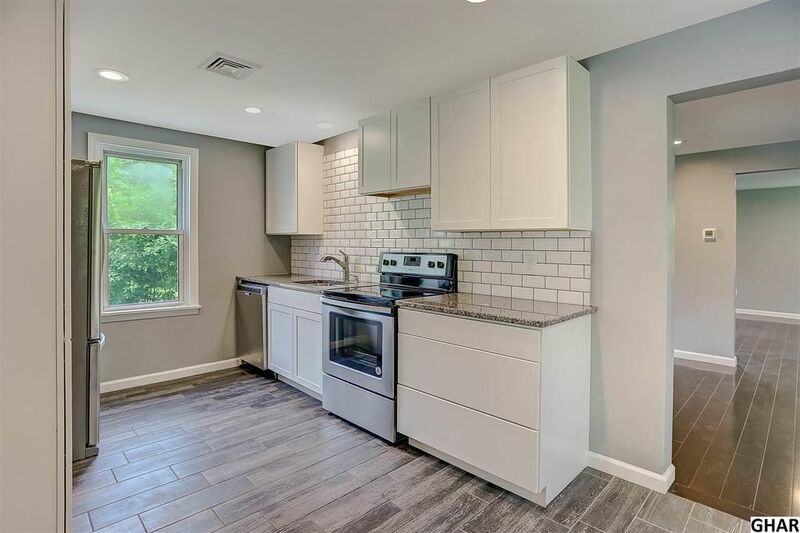 We used the same tile that we used in the kitchen in the mudroom for extra durability. 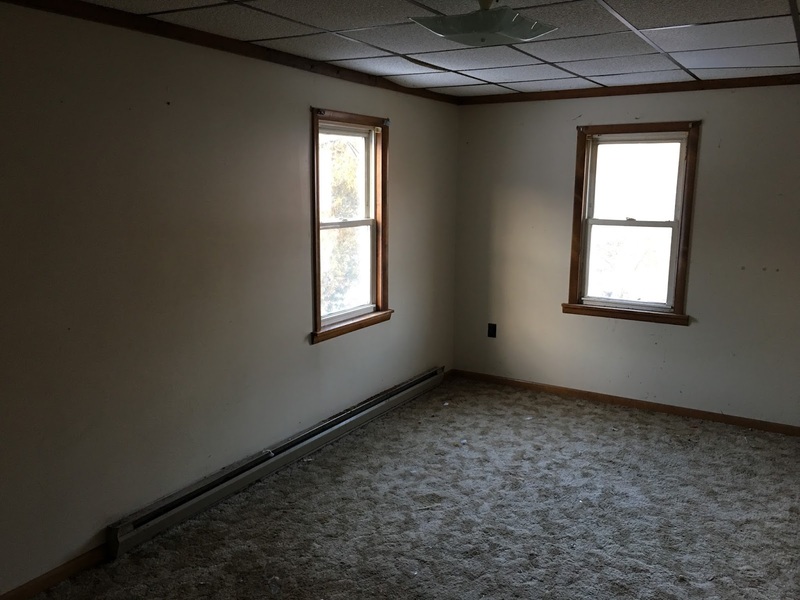 This room also featured the drop ceiling and even included some dark wallpaper. 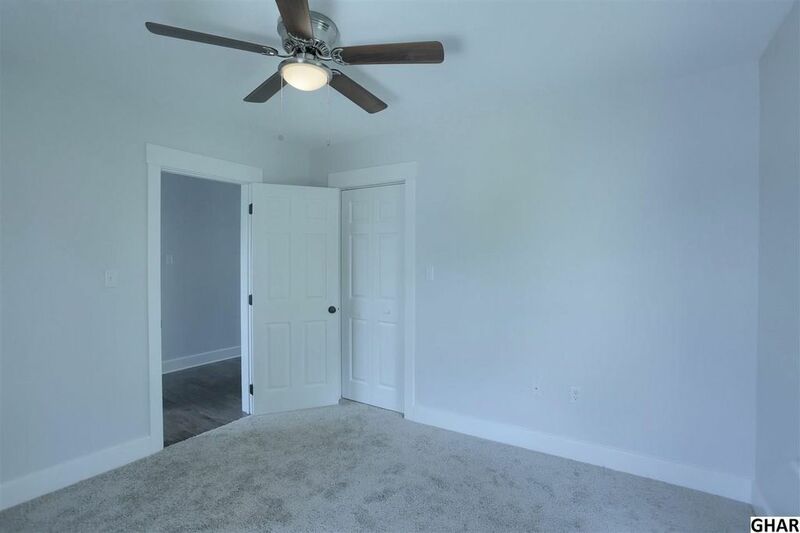 It is located between the kitchen and the living room and has a coat closet. It is also where the mechanicals are located for the newly installed HVAC system. 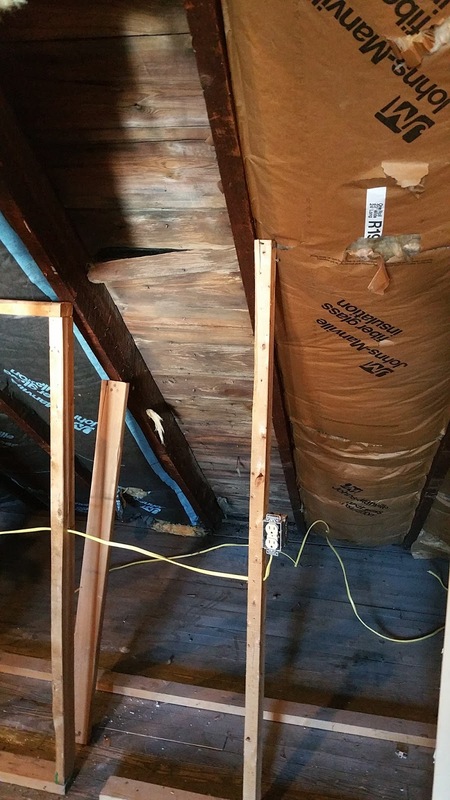 This house did not previously have central air, and the primary heat source was electric baseboard. 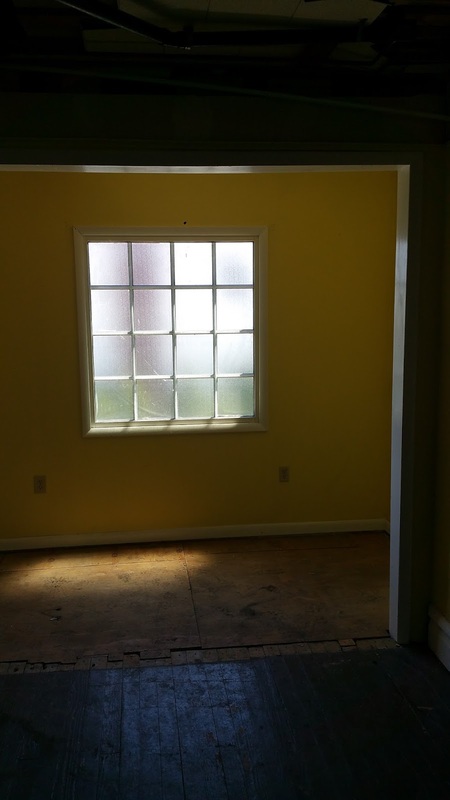 We did not capture many quality photos of this room before the rehab due to lighting, so here are the after shots. 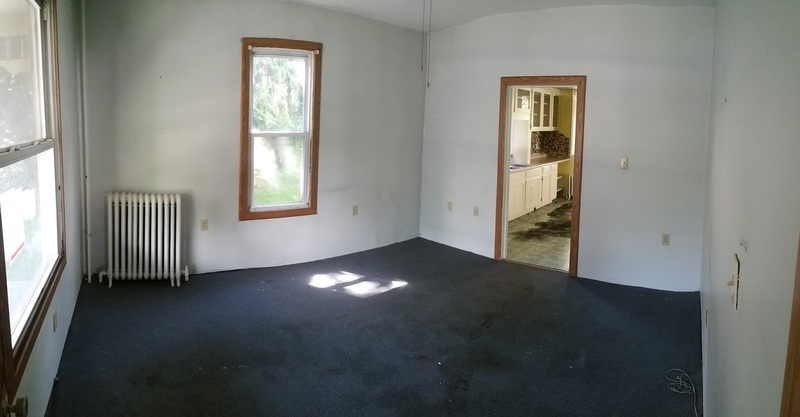 We took out the carpeting and installed wood floors. 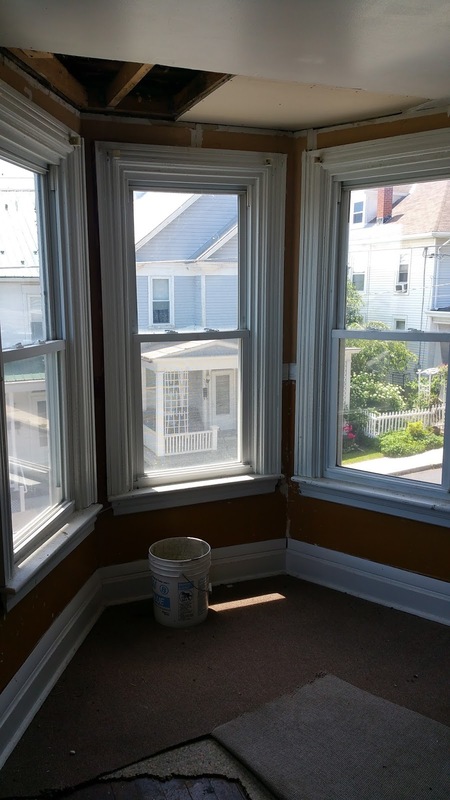 We painted all of the trim and railing in the house white to brighten up the space and make the home feel more welcoming. 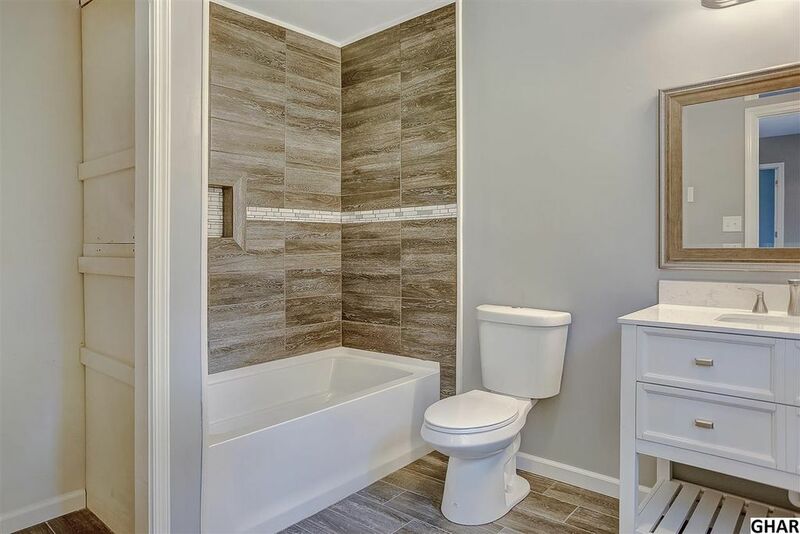 There is only one full bathroom in this home, so it was important to make sure that it had storage and was functional for a family. We eliminated the electric baseboard heater in the bathroom and painted over the busy stenciled walls. 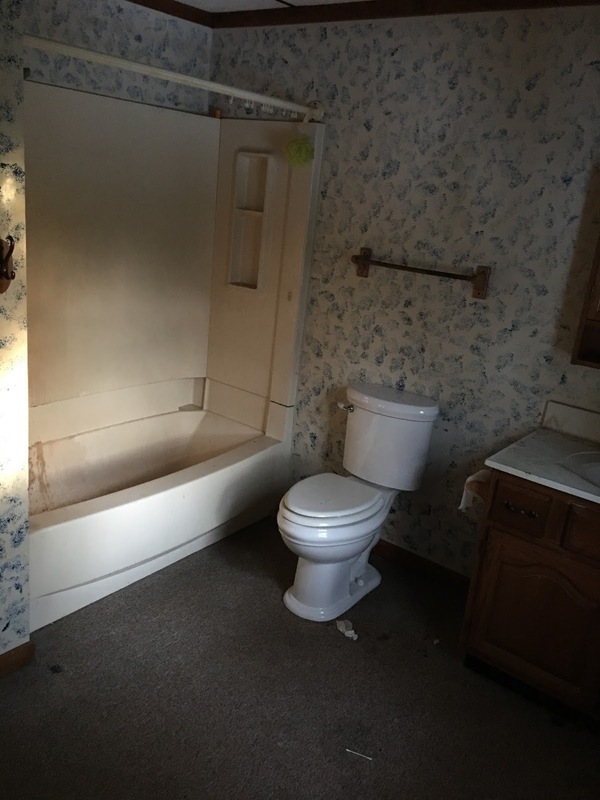 All of the plumbing fixtures were replaced in the entire house. 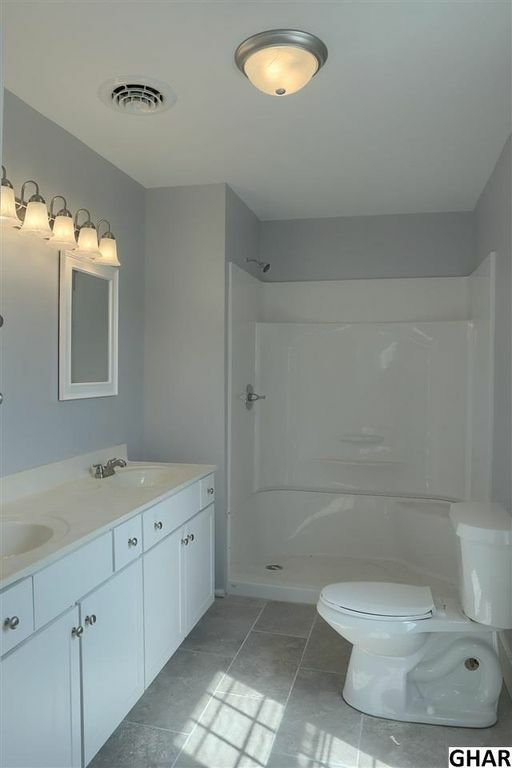 The bathroom also includes a linen closet for additional storage of all of the bathroom necessities. The ceiling was replaced and recessed lighting was installed in all three of the bedrooms. Bedroom and closet doors were replaced and all of the trim was painted white. Overall, we are extremely satisfied with the results of this rehab. 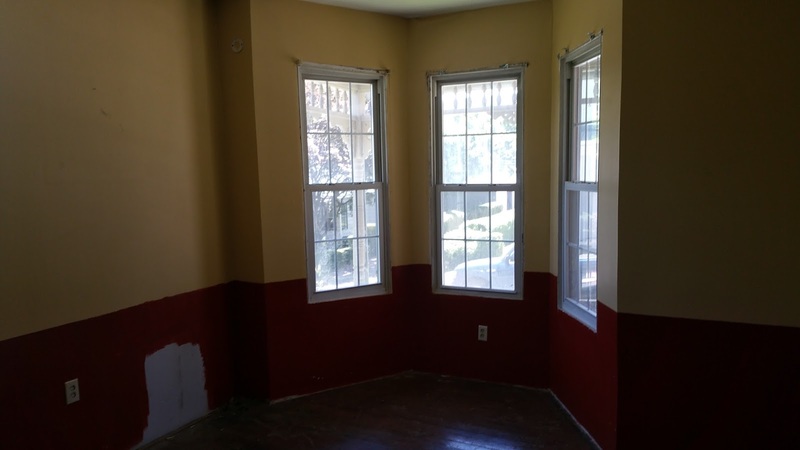 We strive to make ensure that all of our rehabs are up to the standards that we would expect if we were to purchase the property. We take extreme pride in our quality of work an attention to detail. 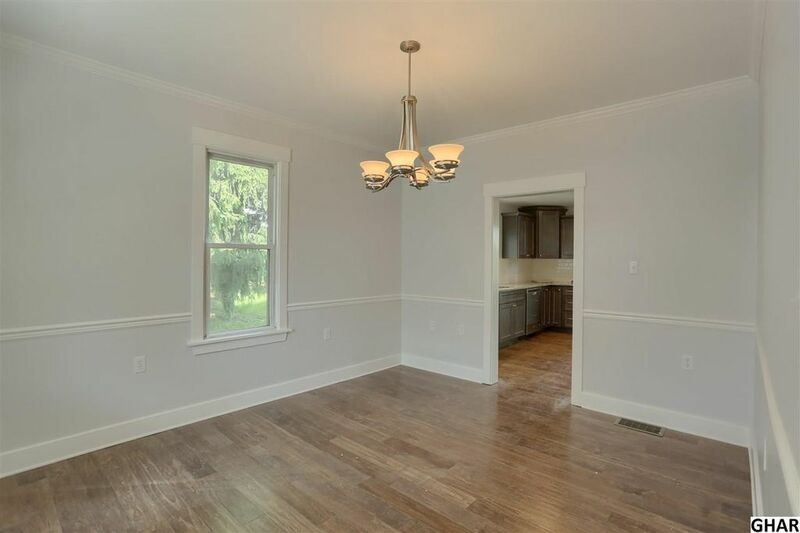 This house sold the same day that it hit the market. We had a full price offer within 18 hours! Special thanks to our partners at Five Star Contracting for their management, design, and construction expertise! We hope that you enjoyed these photos and that you will subscribe this blog for additional updates on our current and future projects. The Old Is Looking Good Again! 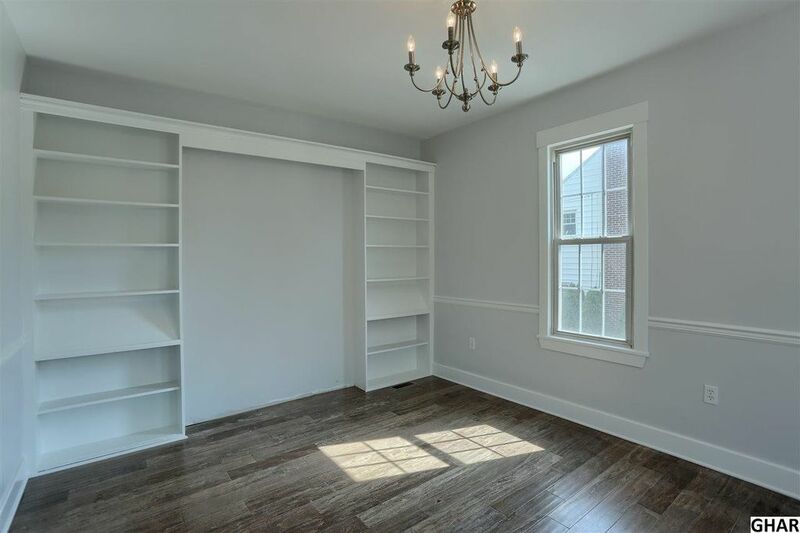 I am going to forgo posting any photos of the finishing details of the house until it is complete (I don’t want to spoil any of the surprises). The whole package is going to be worth the wait, and I assure you that you will be amazed! I can say that the work that is being done is absolutely transformational. A brand new, and improved, roof has been installed and the siding installation is just about complete. 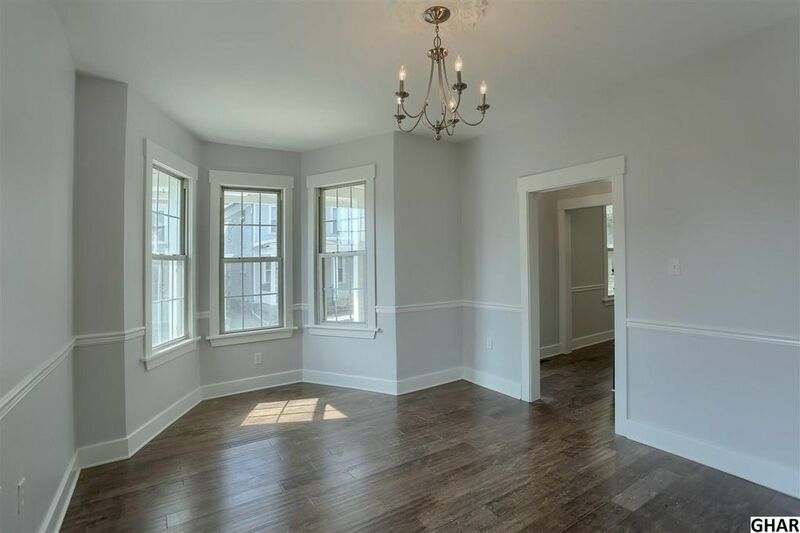 The house is once again a uniform color and it looks spectacular! 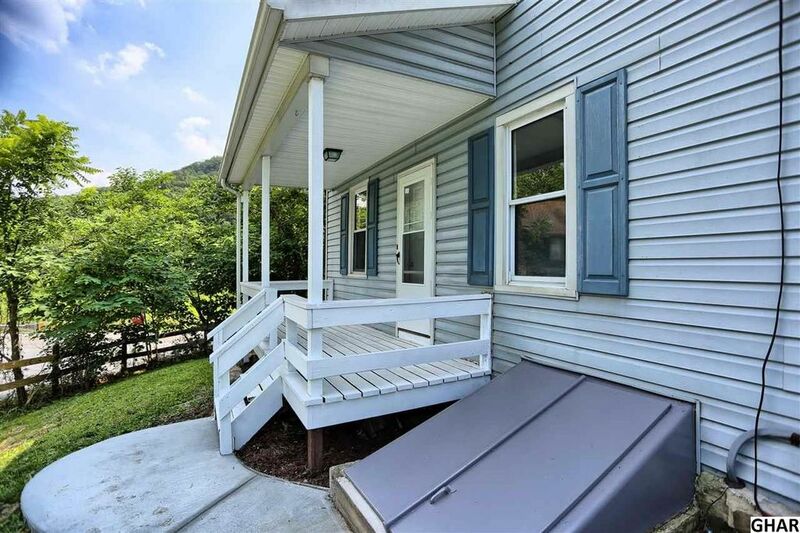 An updated front porch and new trim around the doors and windows is simply going to make this house pop! 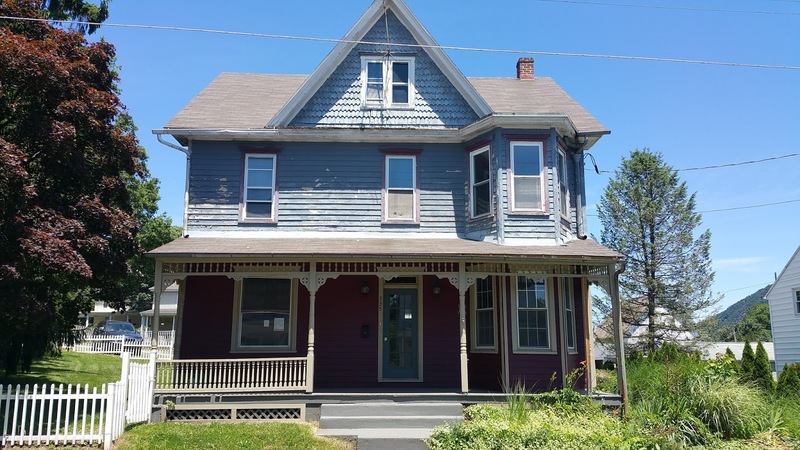 The local community is buzzing about the house, and curiosity and excitement are on the rise, as 335 Front Street becomes one of the nicest houses in the neighborhood. We are so excited to showoff the final product, but you will have to hang tight for a few more weeks until the project is complete. 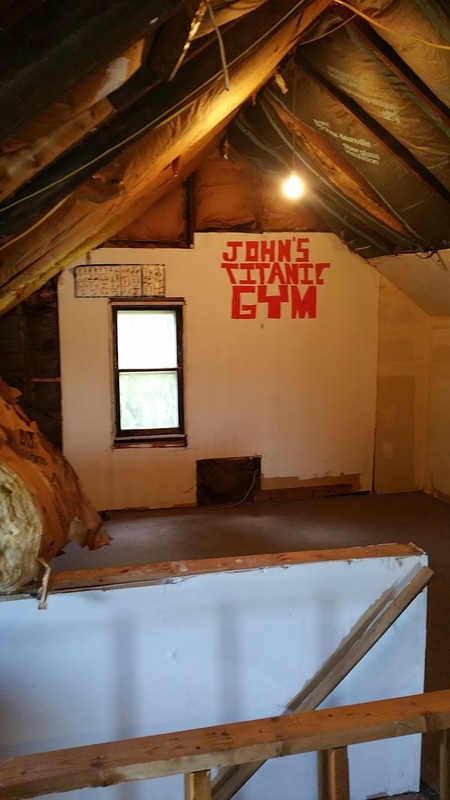 In the meantime, here are a few updates on the progress that is being made on the inside. The installation of the kitchen sink is complete! Just kidding. The white utility sink was cleverly hooked up by the contractor so that they can have access to water for some of the construction activities. However, the water isn’t turned on yet to the house. 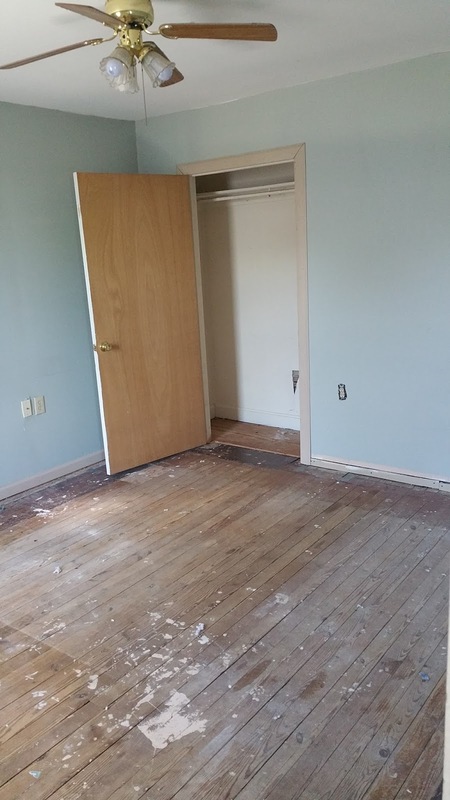 The old flooring has been removed from all of the rooms. 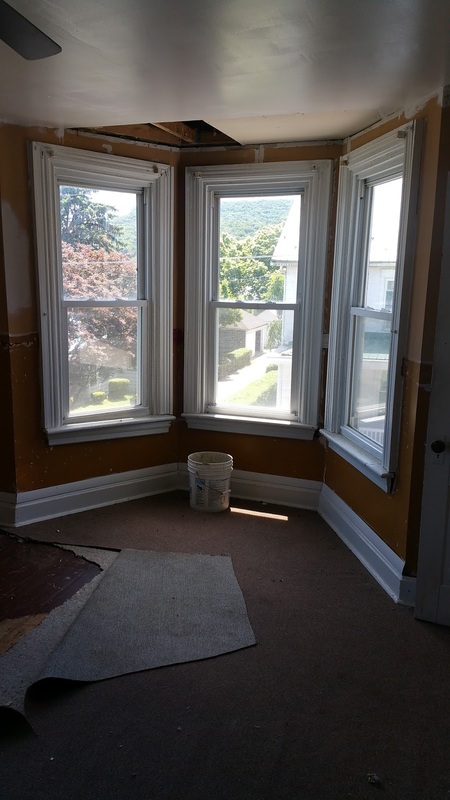 We will be restoring the original 1920’s hardwood throughout the house. It’ll look great in the final photos once the remodeling is complete (better yet, come see it in person when we hold the open house). The electric has been roughed in throughout the house and any shoddy wiring has been corrected. The service had already been upgraded to 200 Amps, so we lucked out on not having to do any upgrades to the electrical panel. To prevent giving away all of the details of the final design, I am going to just provide a general update on the rest of the house. 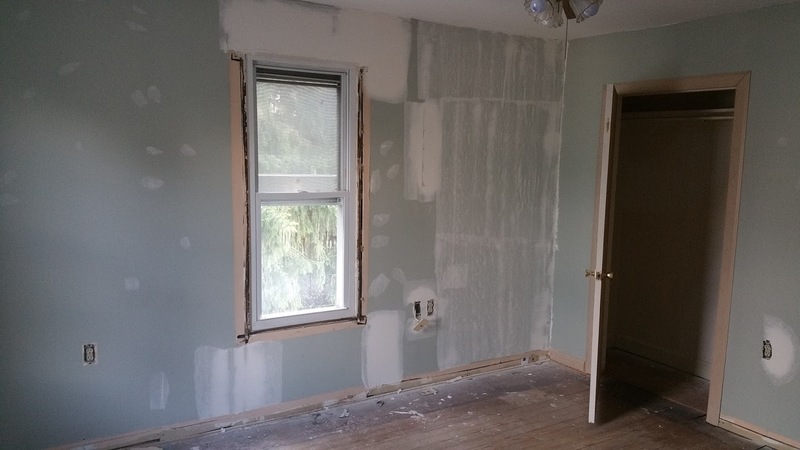 The talented drywall contractor is working his magic and making the walls straight and smooth. 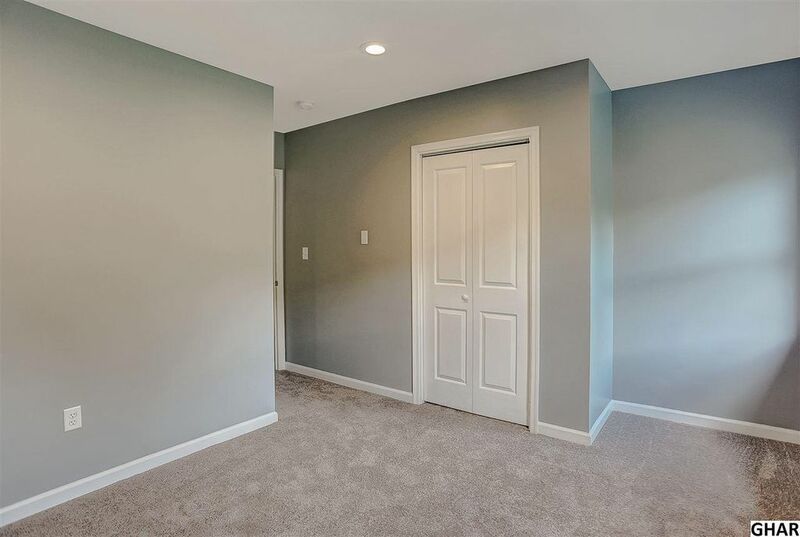 I couldn’t believe the difference it makes to have straight seams and smooth uniform walls. This is truly going to be a new old house! 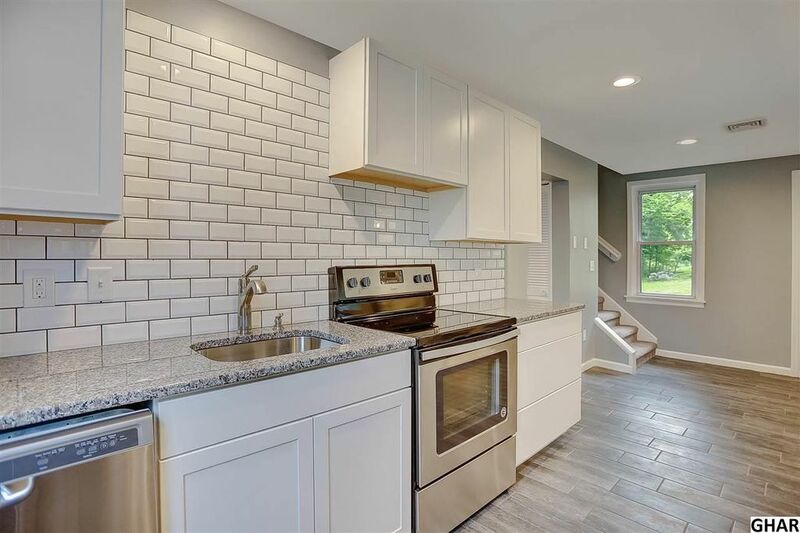 Everything feels brand new with new fixtures and appliances throughout, updated electric, new bathrooms, new roof, new siding, finished floors… I think that you get the point. The progress continues to be on track and we can’t wait to show you the finished home. Thank you for following the progress at 335 Front Street. Let us know if you have any questions or comments. We’d love to hear from you. We’d also love to see you at the open house! We will provide the dates once we get to the home stretch. Removal of siding. 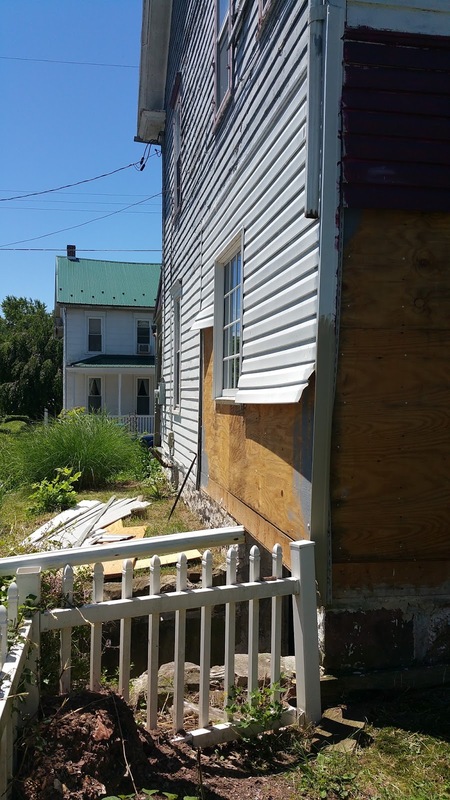 Replacement of the siding on the house is long over due and beyond salvaging. 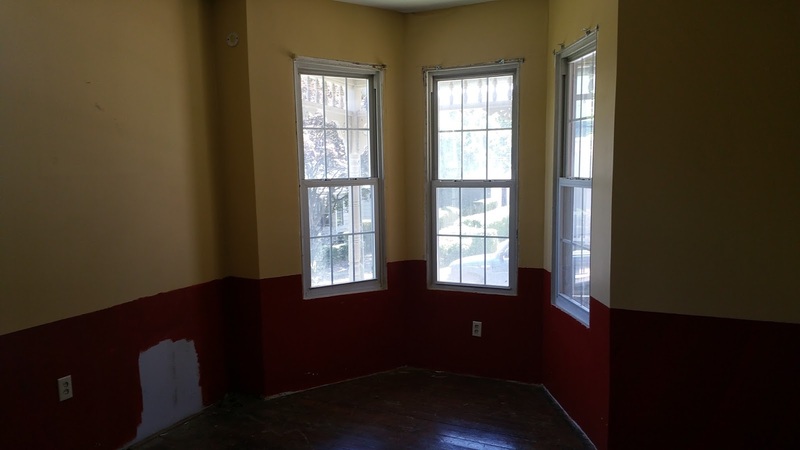 At some point, someone began painting the house and then stopped halfway through leaving the house 3 different colors. 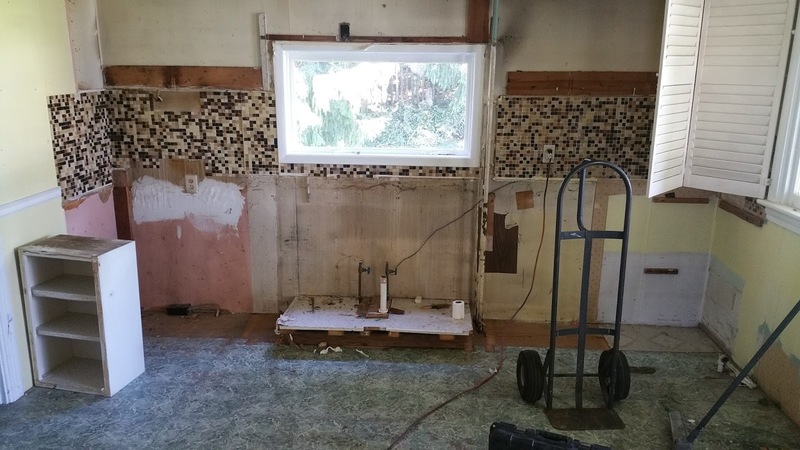 Kitchen demo. 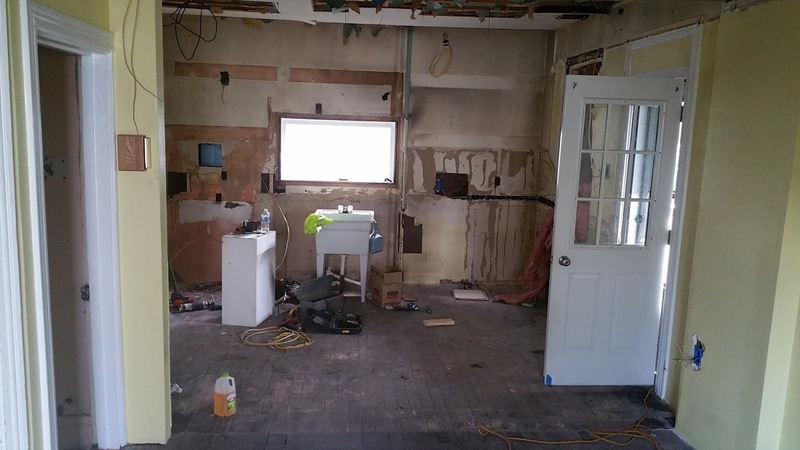 The team removed the stove, sink, 8 feet of cabinets (upper and lower), and a drop ceiling. 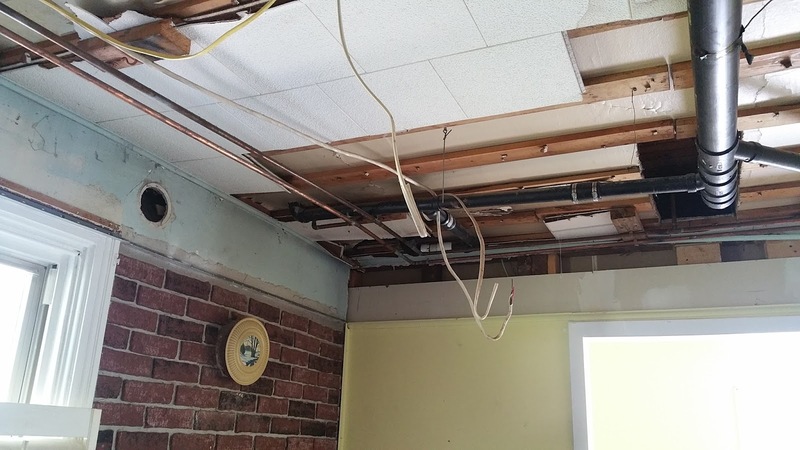 Yes, there was a drop ceiling in the kitchen. This is going to be a great improvement drywalling the ceiling and cleaning up the electrical mess that was left behind. 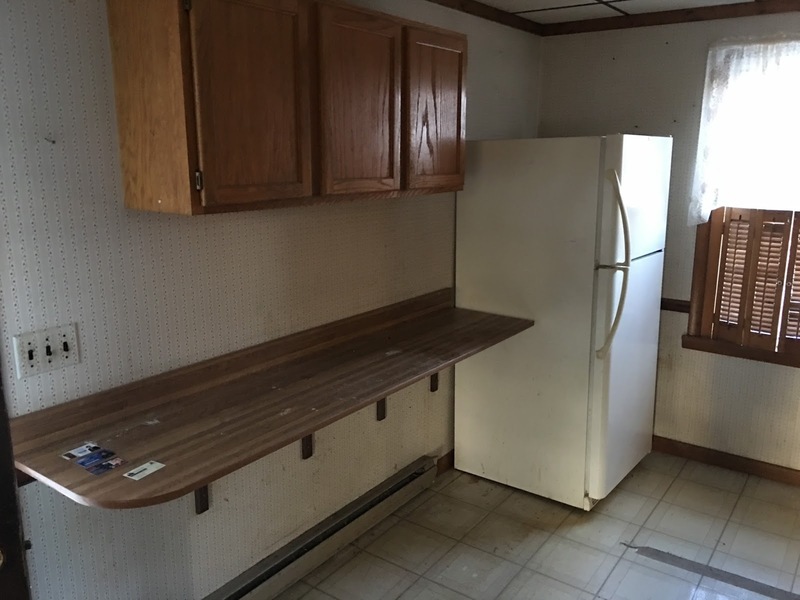 The new kitchen will include a dishwasher and some additional counter space. The plan is to close up the window to the far right to make more room for cabinets and countertop space. We had discussed adding an island for additional storage, but due to the placement of the doors, it would impede the flow of the room. 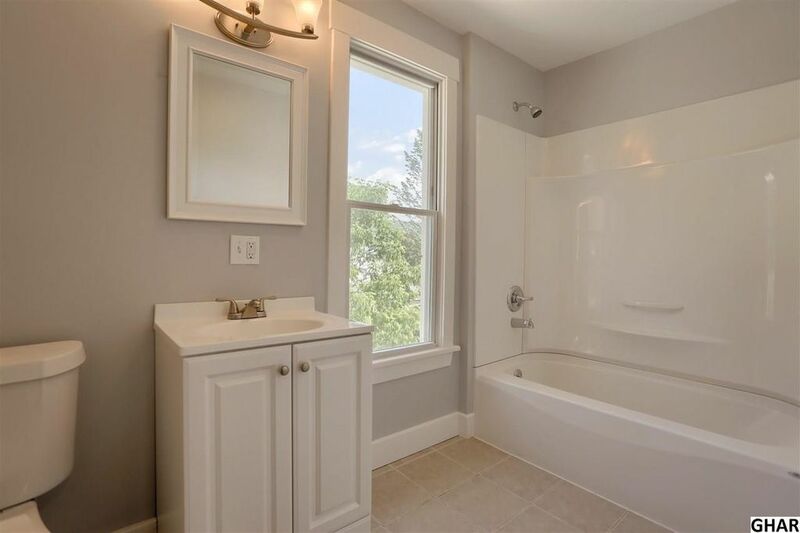 New half bath and laundry room. 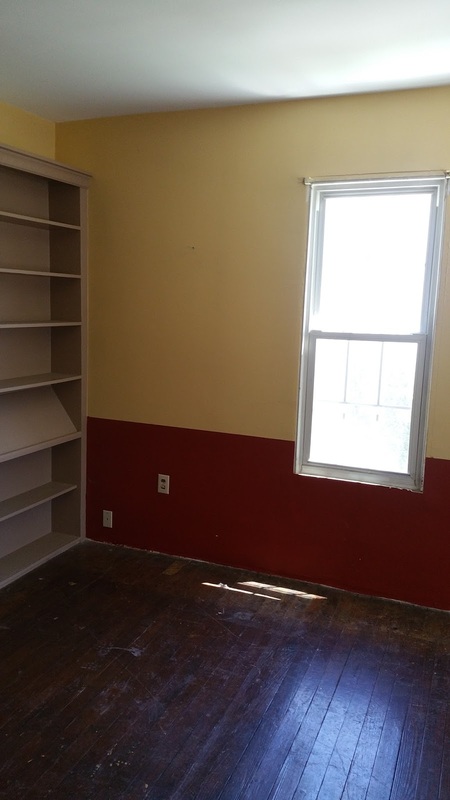 The photo below is a room on the opposite side of the kitchen that will be converted into a half bath and laundry room. 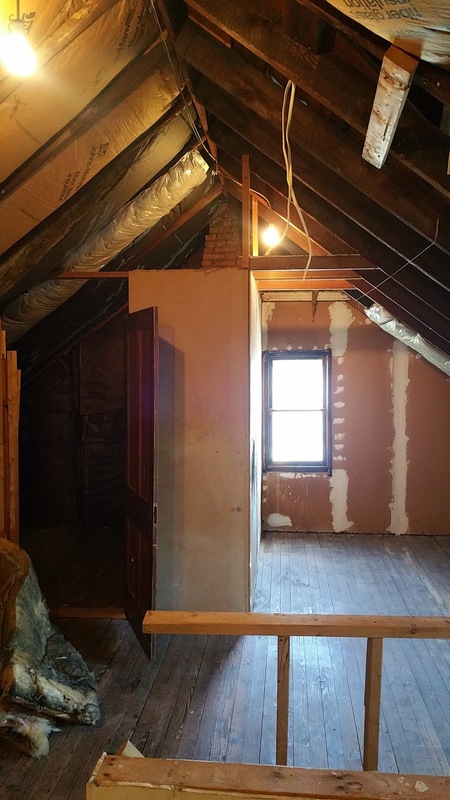 Previously the laundry was located on the second floor within a half bath. 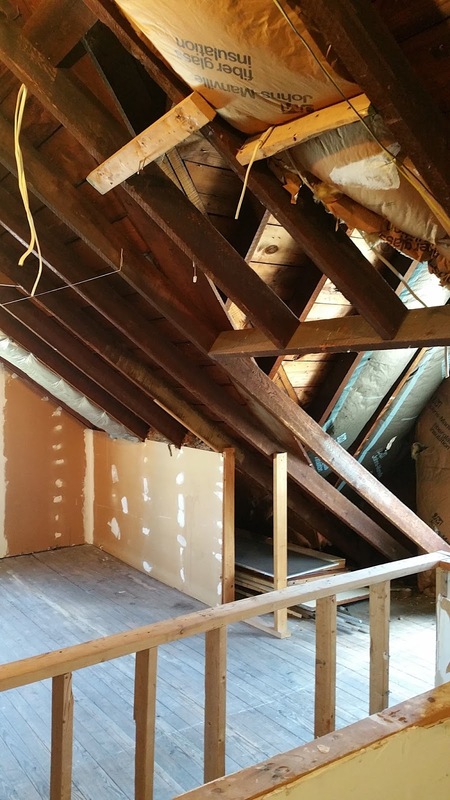 That space on the second floor will be converted into a full bath giving the house an additional full bath. 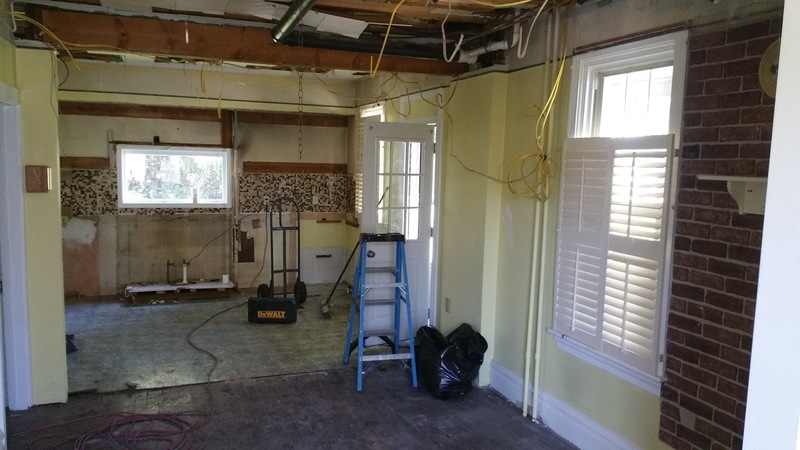 There are two additional rooms on the first floor that needed some minor demo. 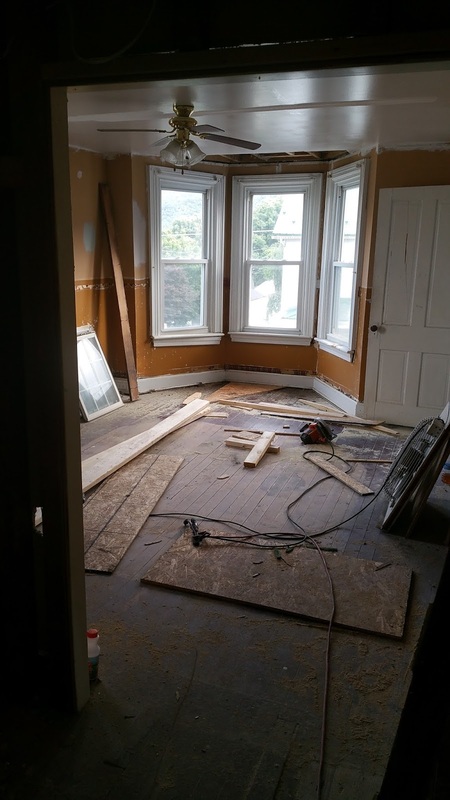 The hardwood floors are going to be refinished where possible. 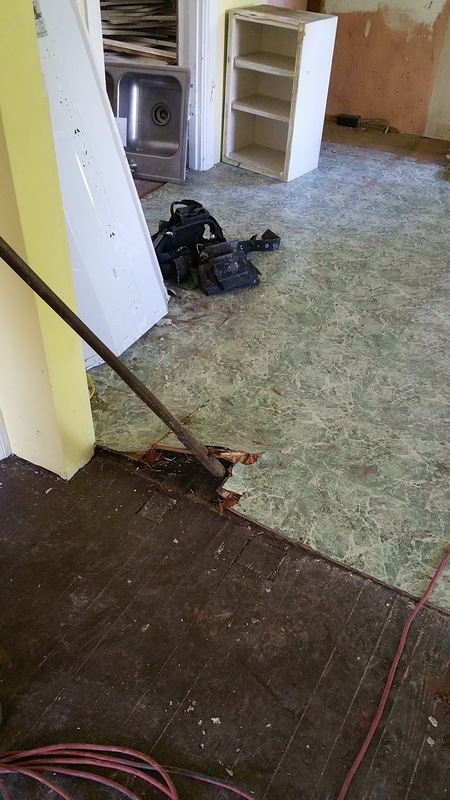 Upon demo, it was discovered that laminate flooring was glued to the hardwood in one of the rooms. 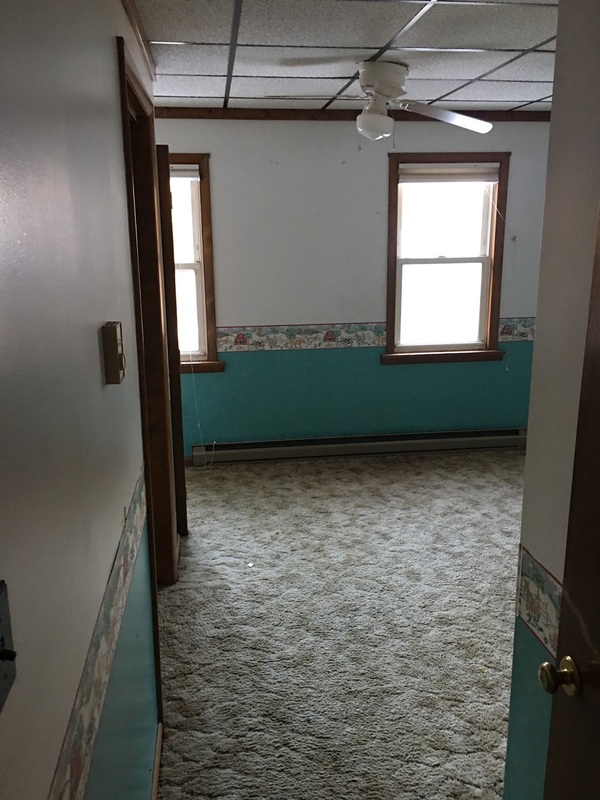 Depending on how removal goes, this room may end up having to be carpeted. 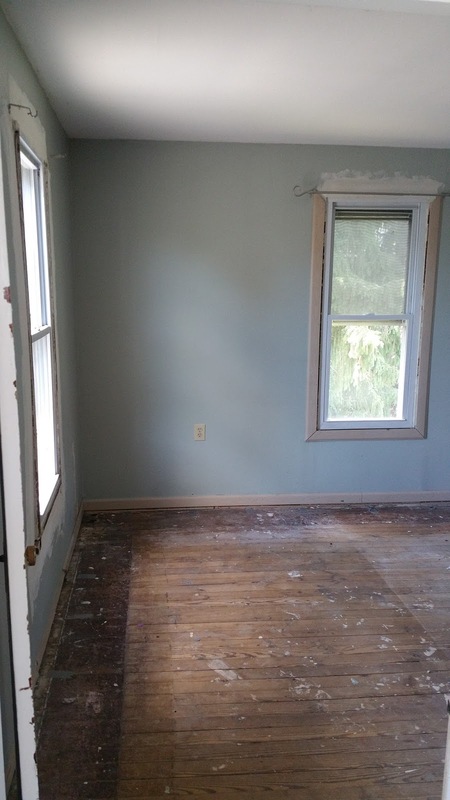 Fortunately, the room with the bump out on the first floor has wood flooring that is in pretty good shape and they will refinish nicely. 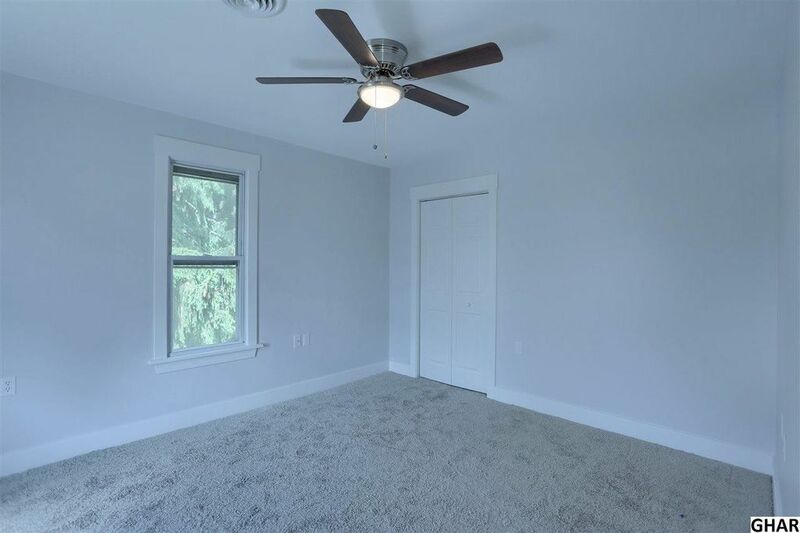 This room would make a perfect office! The radiators, that were previously in each room throughout the house, have all been removed. 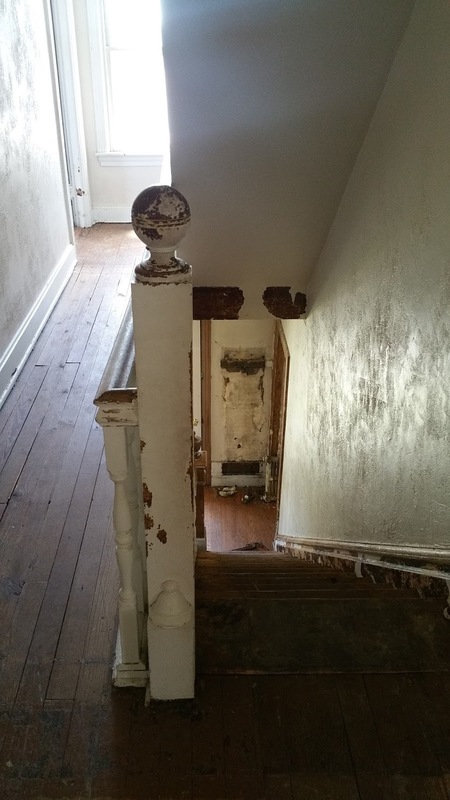 There hasn’t been any demo to the staircase. I just wanted to show a photo of how beautiful this staircase is. 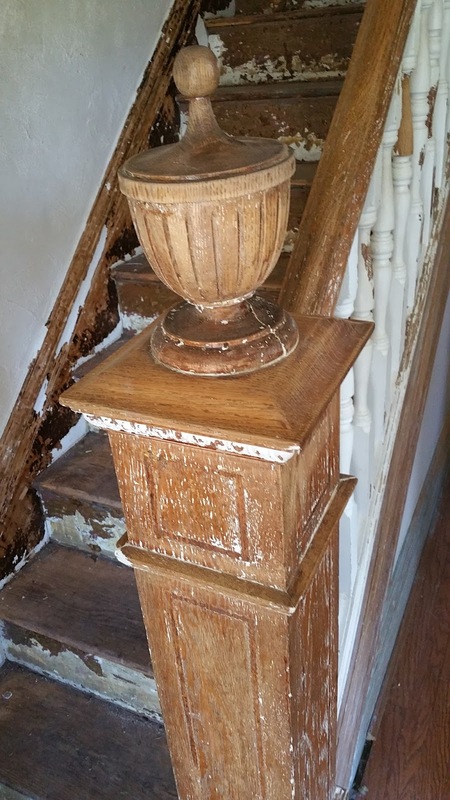 It is going to look absolutely amazing once it is refinished. 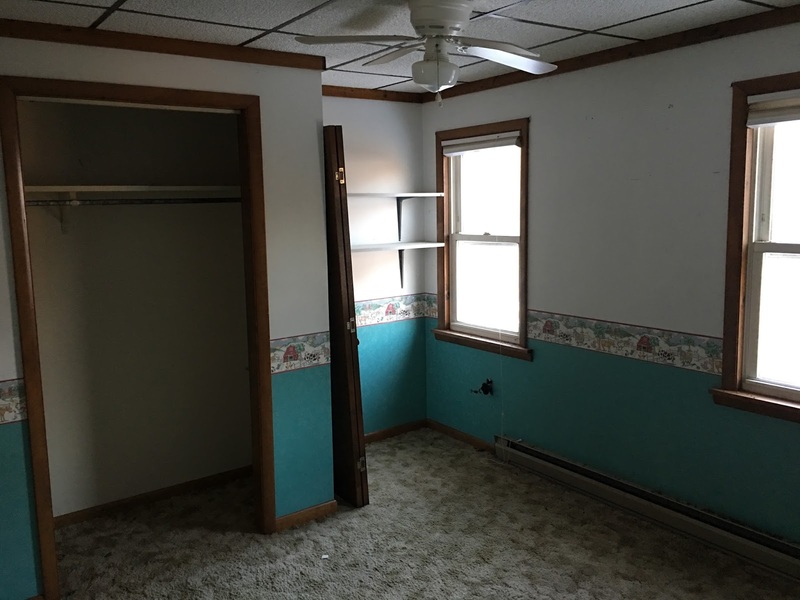 There are three large bedrooms on the 2nd floor of the house. 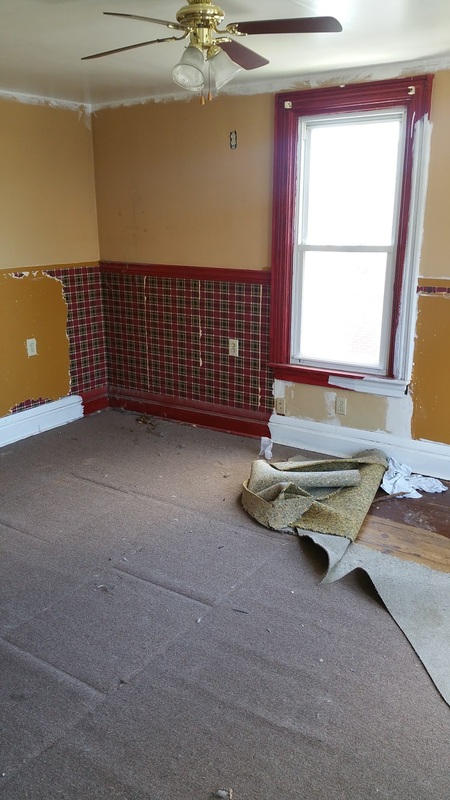 The carpet is being removed and the walls and floors will be refinished. The master bedroom. 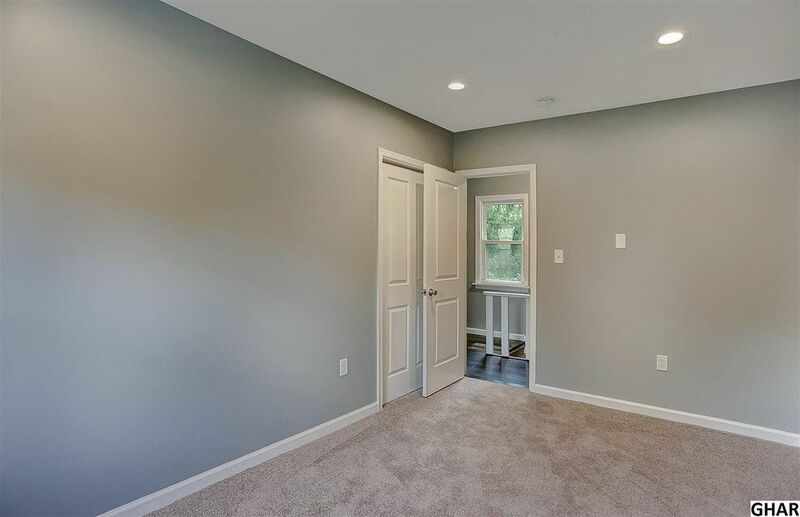 This large bedroom has the window bump out like the front room on the first floor. The demo for the master is not yet complete in these photos. 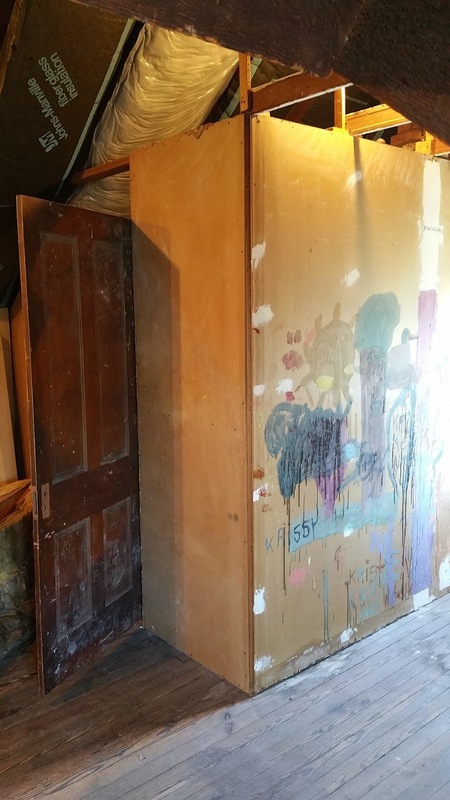 The closet is being enlarged to be a walk-in and a door to the bathroom is being added to create an ensuite. The 3rd floor bonus. 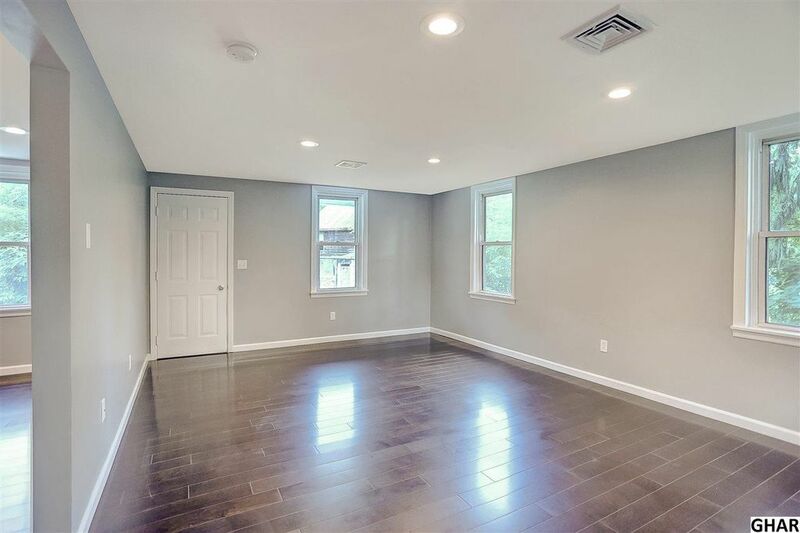 There is an awesome and very spacious 3rd floor. 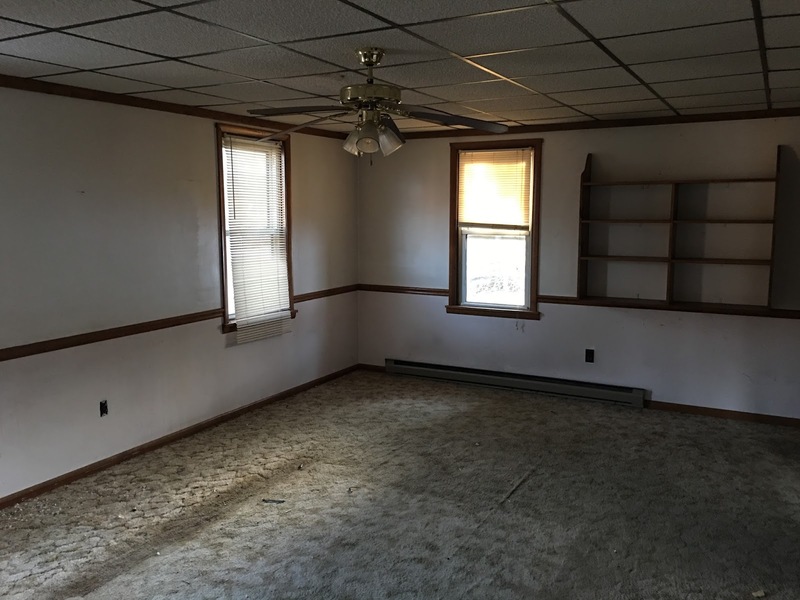 We do not have plans to finish this area since the home will already have 3 bedrooms and 2 1/2 baths, but this could be a great opportunity for the new homeowner if there is a desire to finish the area or simply used for storage. 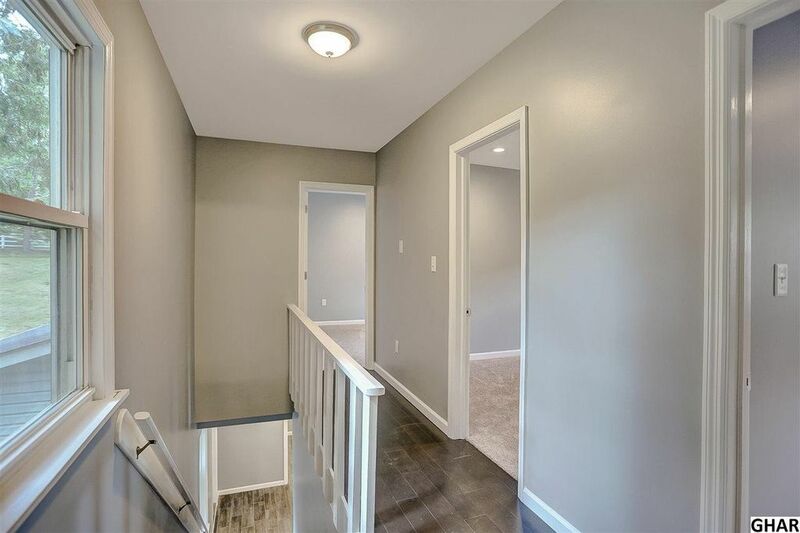 Access to the 3rd floor is a walk up staircase for easy accessibility. 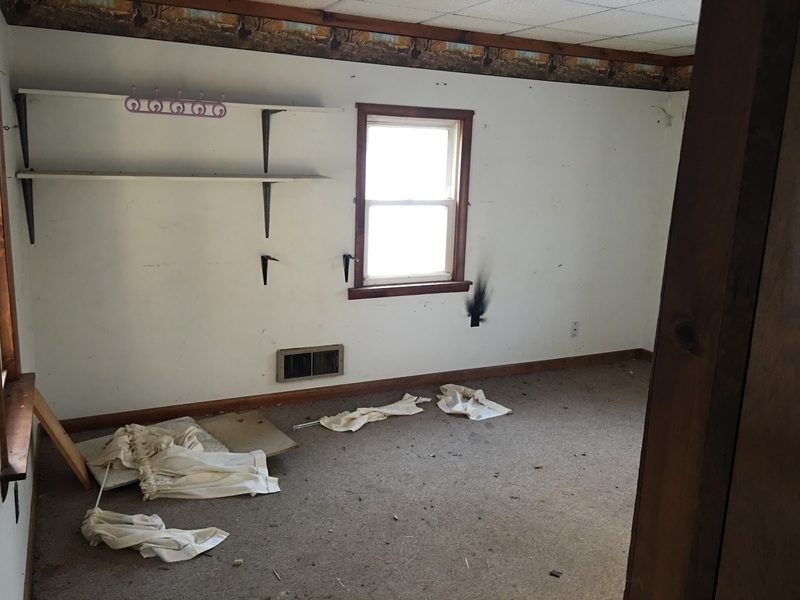 This property was acquired in May of 2016. This was an exciting purchase for us for a number of reasons. First of all, it is our first redevelopment project. Secondly, this property is full of charm and so much potential. 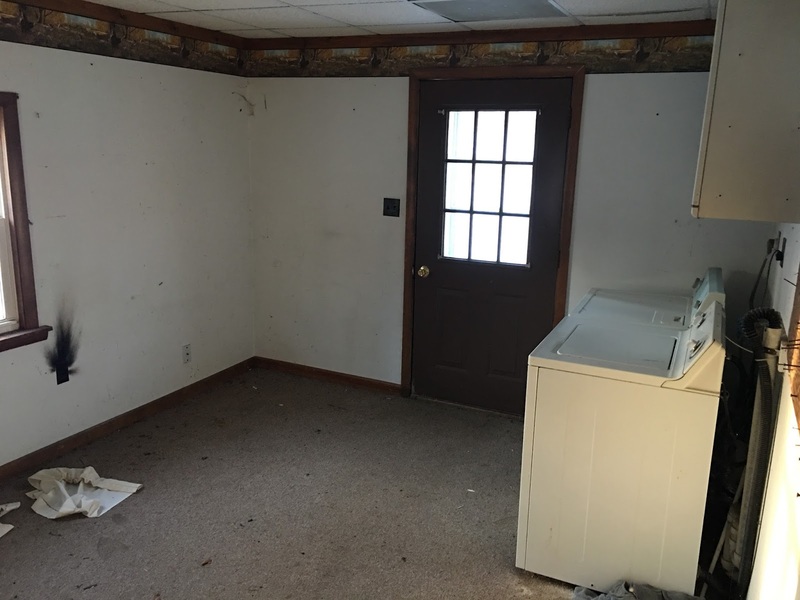 The terms of the acquisition did not allow us to view the inside of the property until we closed on the property. The house is zoned residential in a quite residential neighborhood. 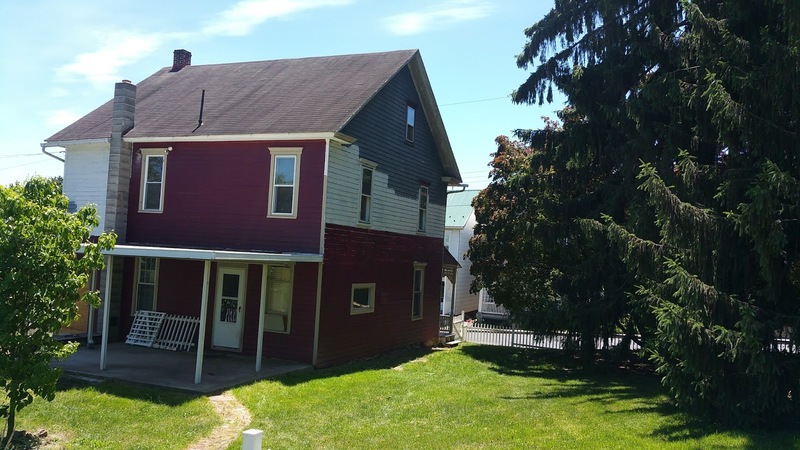 The 1920 victorian style home has a beautiful front porch, a double lot, and a breathtaking view of the Susquehanna river from the back patio and the master bedroom. New HVAC system with propane heat and central air-conditioning. 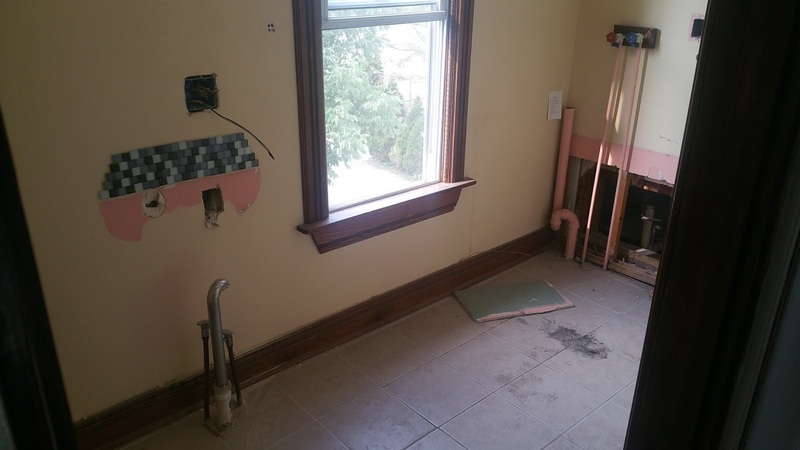 Requires running ductwork throughout and removing the existing heating system. The most unanticipated expense for this project is the installation of the new HVAC system. 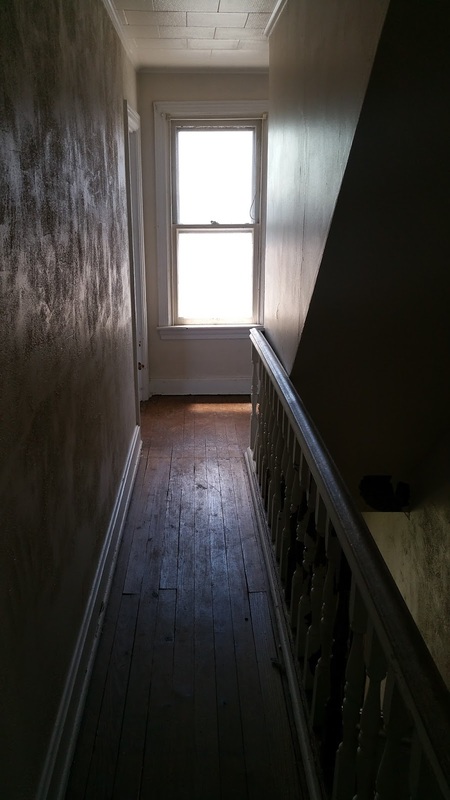 Upon gaining entry into the house, we found that the radiators of the hot water system were cracked due to the water in the system freezing over the winter while the house was vacant. This meant that all of the radiators would need to be replaced or install a new system. The decision was made to install a new HVAC system, which requires running new ductwork throughout the house. This will give the house the benefit of central air conditioning and a propane heating system. There are plans to install natural gas lines throughout the town in the near future and the propane system could be easily switched over to tap into the natural gas line once it is available. Are you ready to buy or sell a home? 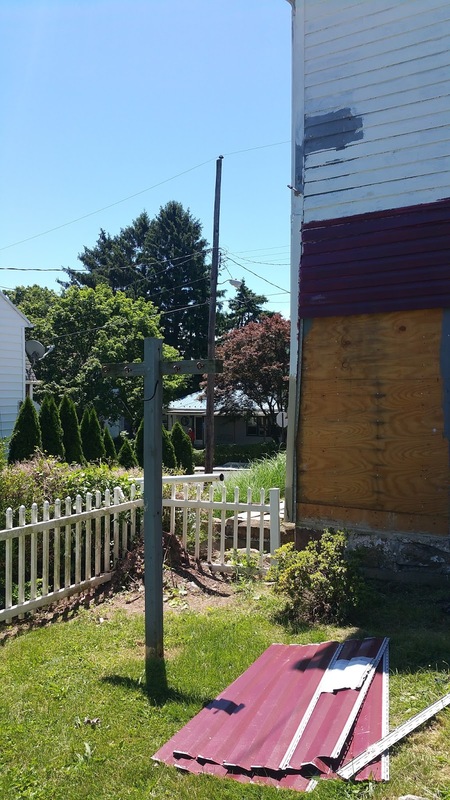 Do you have questions about residential redevelopment? That’s great! We would love you hear from you.